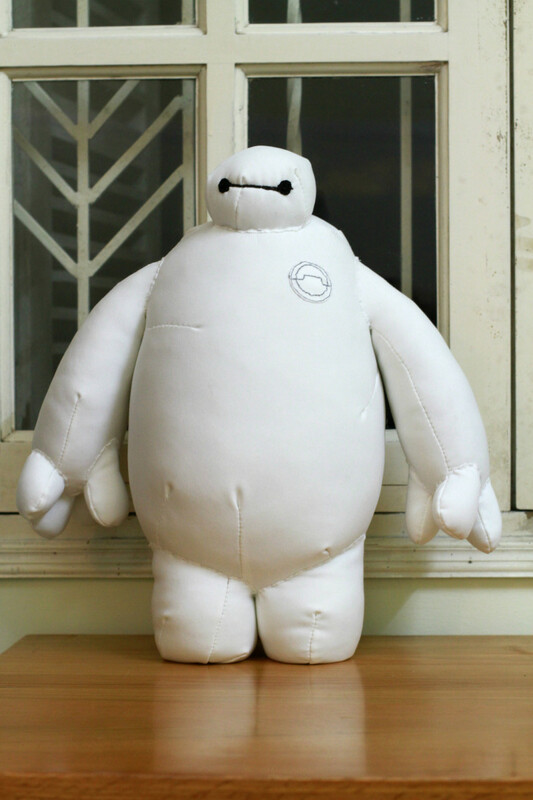 Craft a Baymax stuffed toy today! 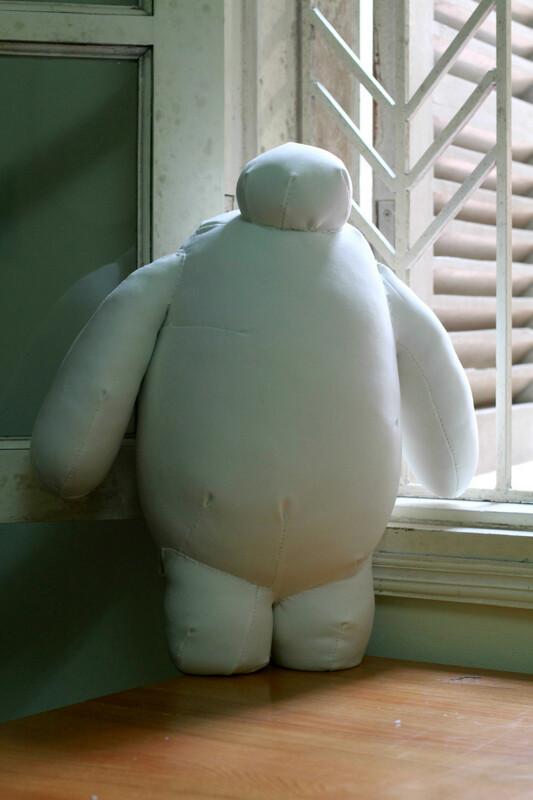 Once upon a time, the movie Big Hero 6 came to the big screen without me noticing even the slightest (how did that even happen?!) . 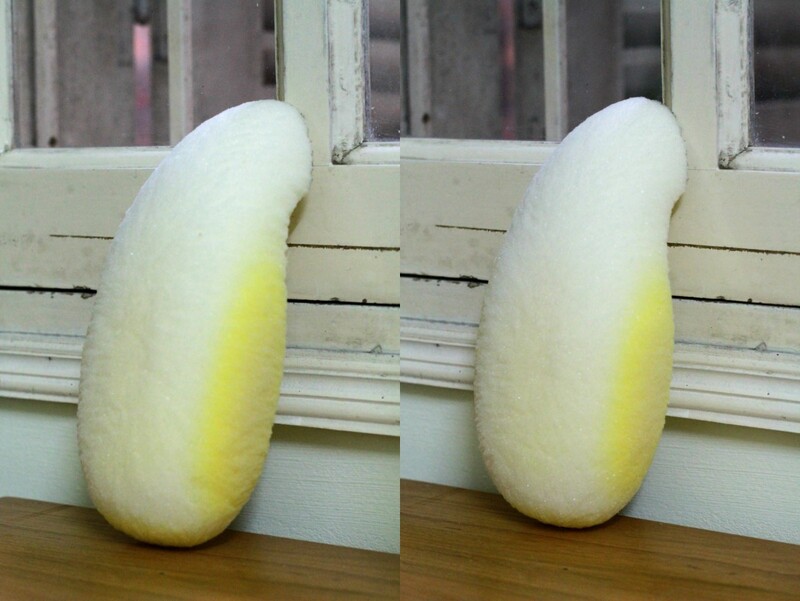 One day, an acquaintance brought it to my attention. 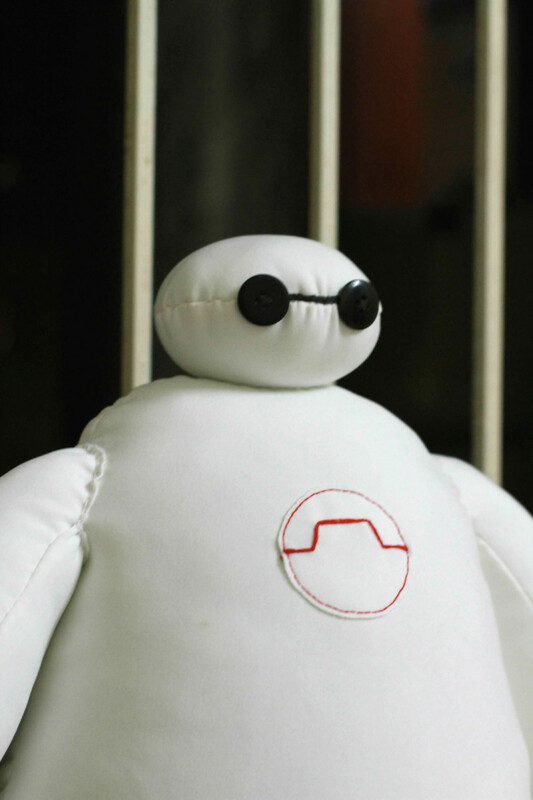 After seeing how enthusiastic she was about the animated feature and especially about a particular character called Baymax, with a rather vague idea of what it was all about, I thought 'what the heck' and checked it out. Although with some minor shortcomings here and there, it had quite a number of amazing moments and an incredible ending (don't worry, no spoilers here). But this hub isn't about the movie. 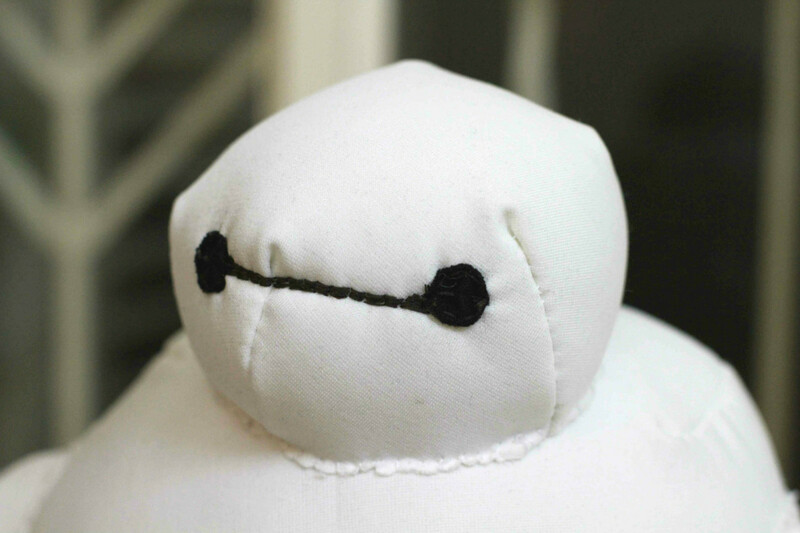 As I discussed the experience with the acquaintance afterward, it seemed as though she was brought right back to the theater and her unmistakable overwhelming excitement about how completely adorable Baymax is once more swept me right off. You've seen the movie, you know what I mean. See the movie, you'll know what she means. And then came the thought. 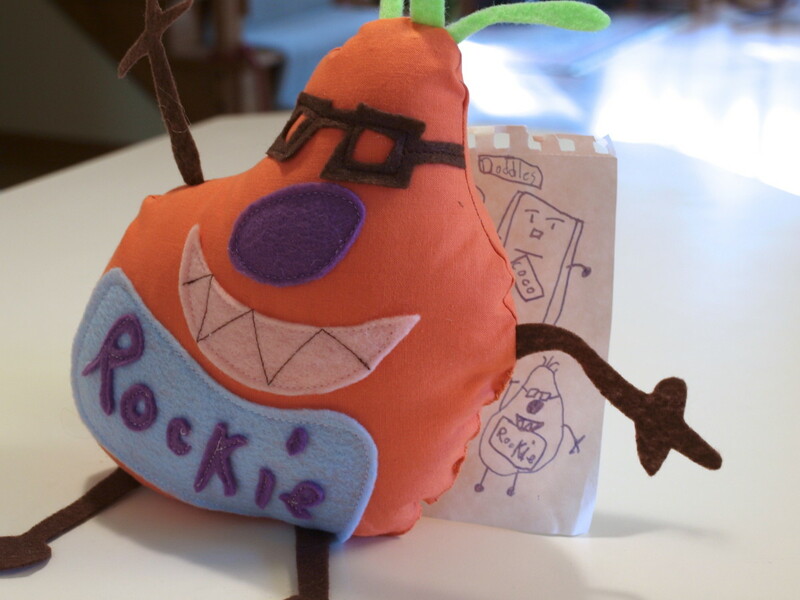 What could be more of a delightful surprise than a cute home made stuffed toy out of the blue? 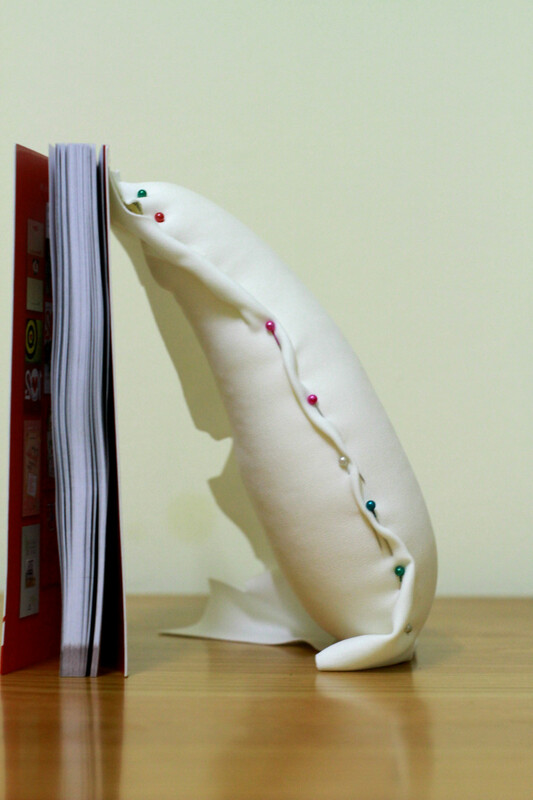 To write a hub on such a project, I guess you would expect the author to be someone who is particularly good at making stuffed toys or have had in depth, long term experience with the topic. Considering the inefficient manner of working and many, many errors made along the way, I wouldn't say I'm particularly good at this, or at least not yet. Furthermore, the last time I had any intensive (as in doing for longer than a minute) practice in sewing and crafting was back in fourth, maybe fifth grade, so yea, can't brag about any prodigious experience either. 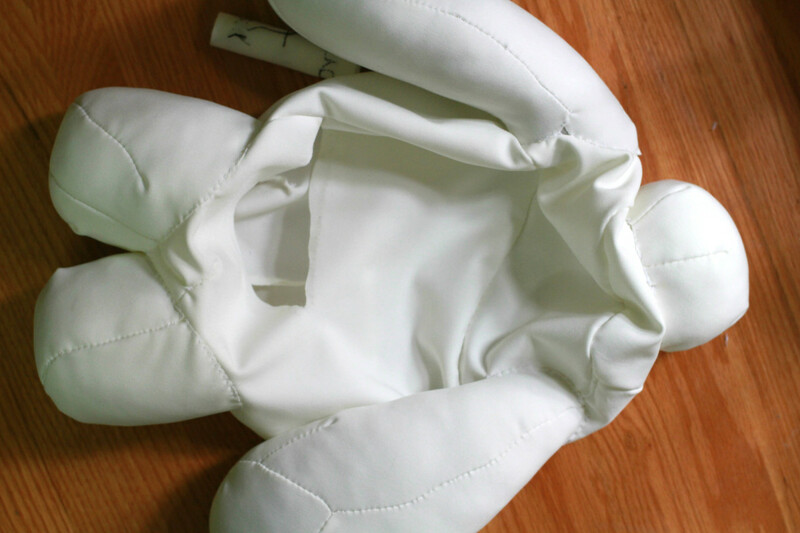 I don't have any factual statistics, but if I were to guess, most of the general population isn't that well acquainted with the skills involved in making a stuffed toy. Have been and still am very inexperienced, I could relate well with many key difficulties in learning this field from scratch and thus point out little tips here and there that more experienced craftsmen may take for granted and not pay too much attention to. Furthermore, Hubpages is a community with perhaps many skilled craftsmen and craftswomen already lurking around. Look forward to receive constructive criticisms for my current magnificent ability to fall short. Well then, let's jump right in! 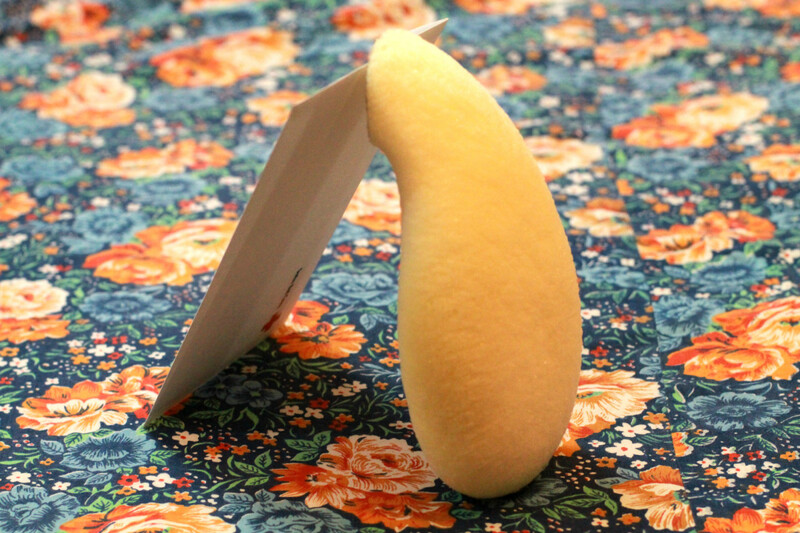 Just as it sounds, a stuffed toy is stuffed with stuffing, and what is the stuffing stuffed in? 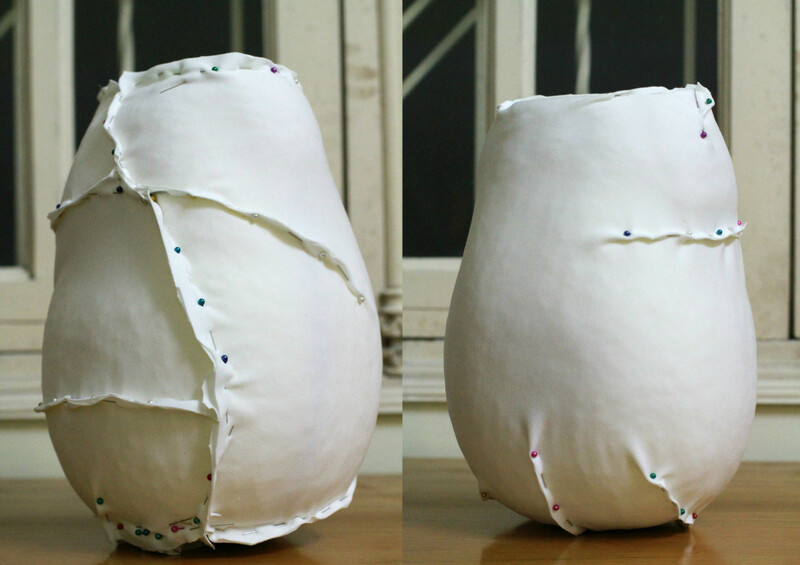 A layer of fabric.Now, imagine how difficult it would be to translate the shape of the model in mind precisely and accurately into a 3-D physical figure. 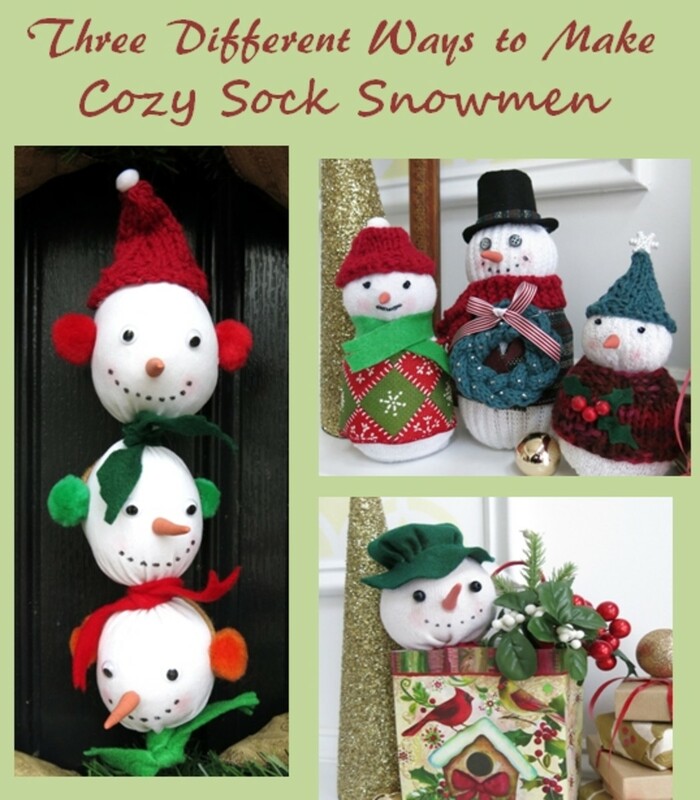 From scratch with only the image in mind and fabric and scissors on hand? If you can do that, just skip to the end. For most of us, such a direct way of doing things rarely yields any significant result. Fortunately tools can be used to our advantage. The first step is translating images in mind (with a lot of help from the Big Hero 6 movie trailers) into 2-D in the form of orthographic sketches of the front and side view. 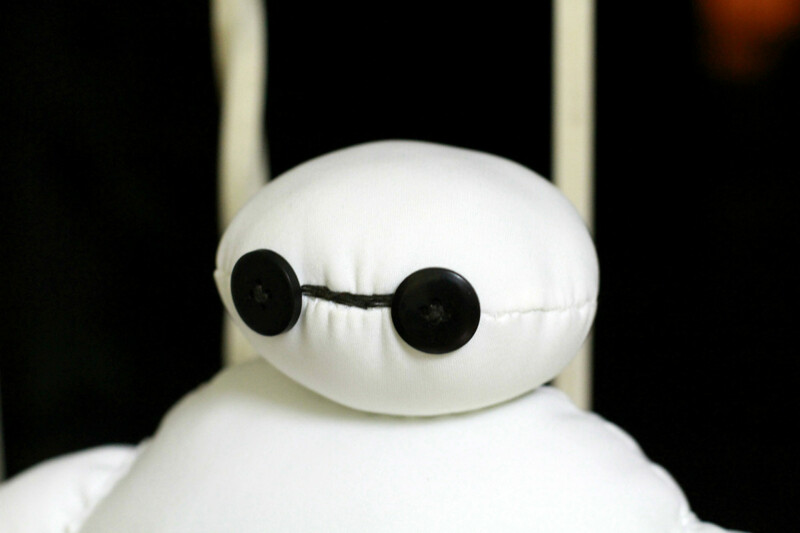 These when taken together give a complete sense of how Baymax would look like in 3-D through 2-D views. 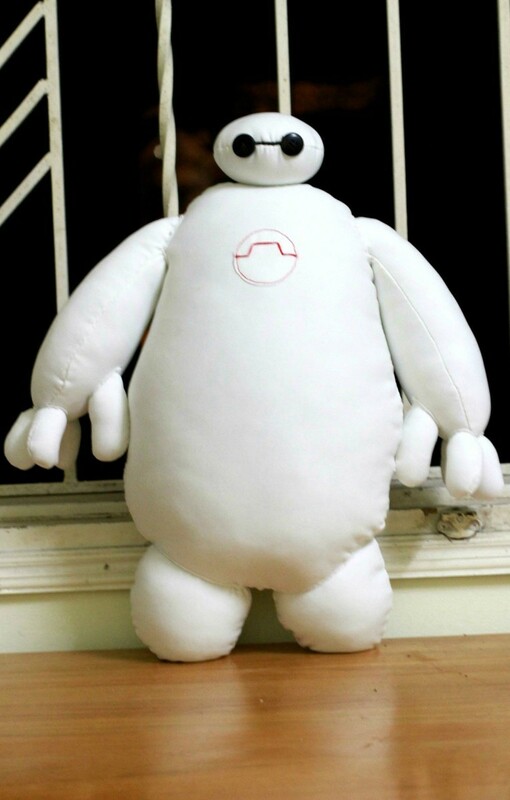 To be precise, since my initial plan was to make his (Baymax is a male right?... 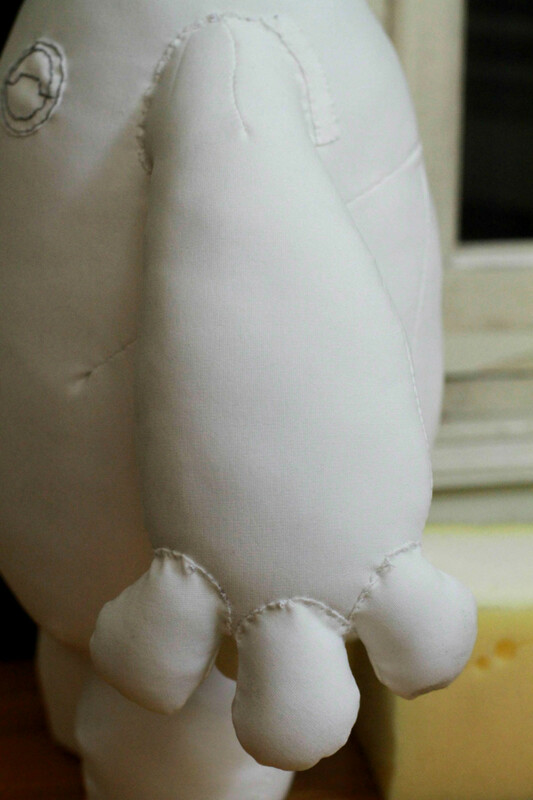 from the voice in the movie) body parts separately and then attach them together, I drew the parts separately. After that was done, the drawings were scanned. 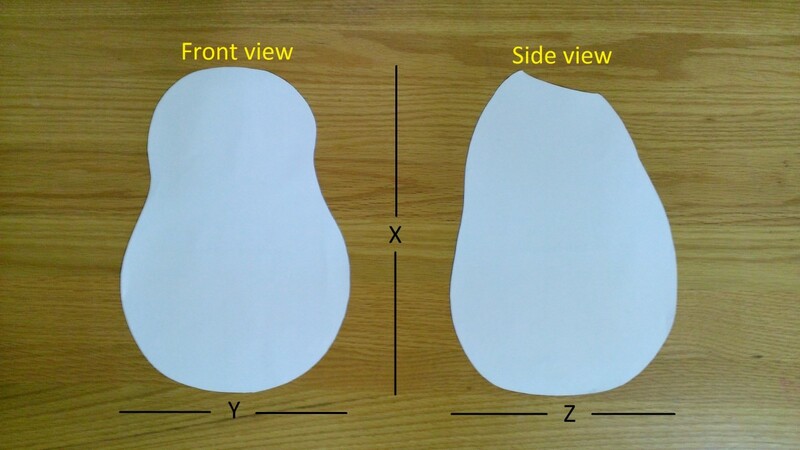 It's very important for the size of different body parts to be proportional with one another in the final orthographic drawings, otherwise Baymax would turn into, well, Deformed Baymax when being translated from 2-D to 3-D.
Also, the vertical dimension of the front and side view (the X-axis in orthographic figures below) drawings of each part must ideally match, otherwise the translation from 2-D to 3-D would result in deformity. 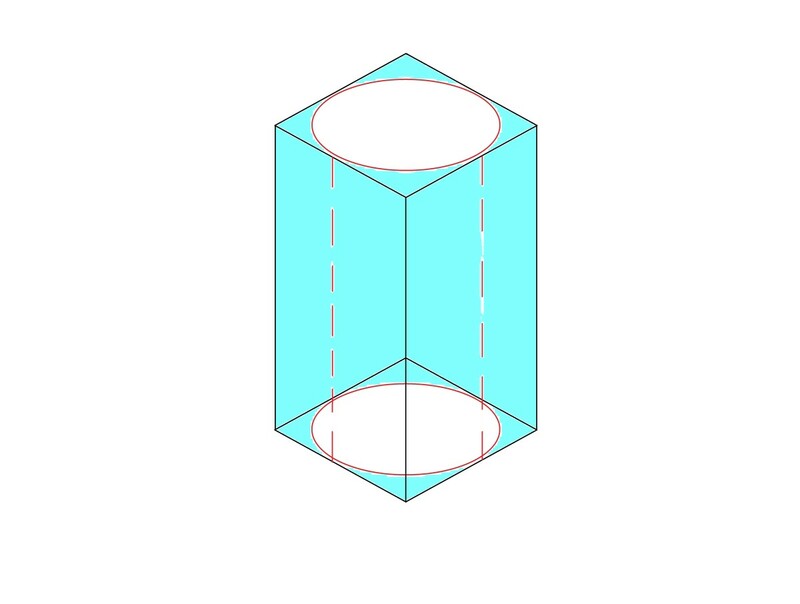 Nevertheless, don't be too concerned with making initial drawings of the parts proportional with one another or the front and side view drawings vertically equal right away. 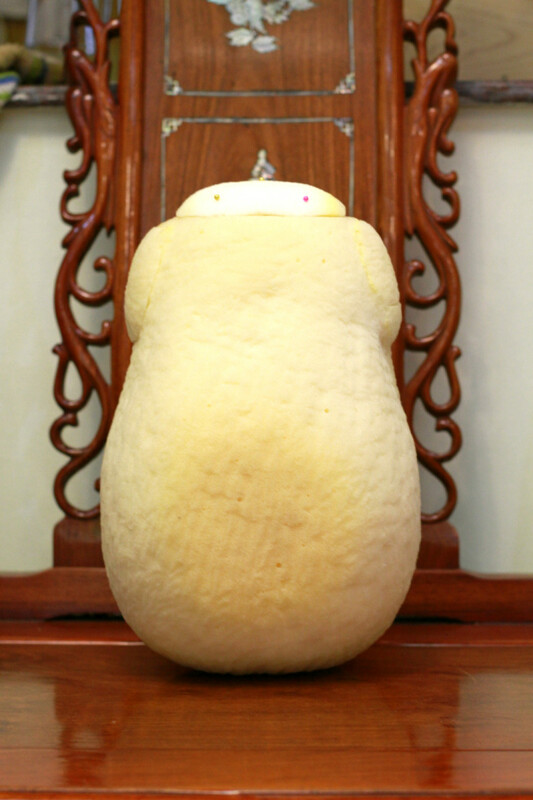 Just have their individual shape as accurate and precise as possible first. After scanning the drawings, each drawing can be re-sized and edited to achieve optimal general proportion and dimension. 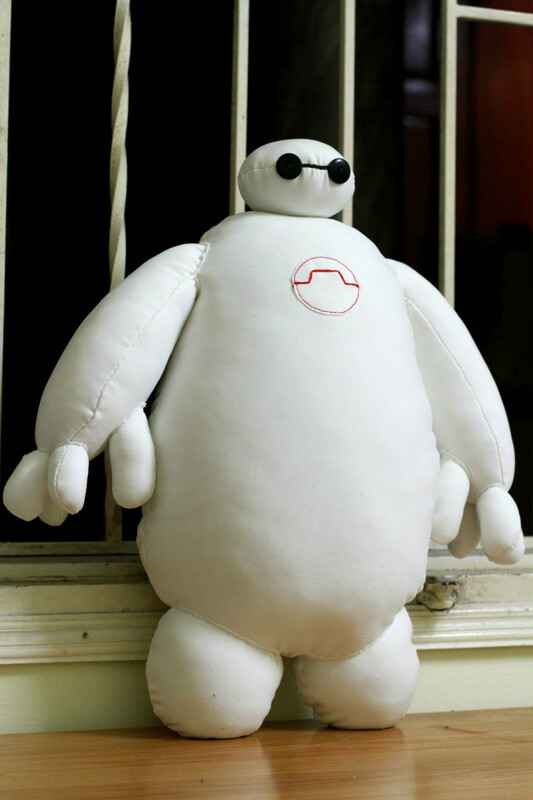 Referring to a clear picture of Baymax with all body parts in plain view helps a lot with adjusting dimensions and proportions. Another reason why scanning drawings is a good idea is so you can hold copies for longer and reproduce them a lot easier and quicker, considering hard copy drawings more often than not face greater risk of being perishable. The front view is also the back view in this case (same size after all). Ideally, orthographic drawings should include the front, back, side and top view to produce the most accurate 2-D framework. If you feel adventurous like I did (or was it lazy?) then can just settle with the front and side view and start from there, but this is probably the barest minimum that still allows a relatively effective final result. By using the rotate tool (around the vertical axis) in Photoshop or other photo editing software's (free online versions are available too), the scanned drawing of an arm (the left one in this case) can be used for the other arm also. The principle with arm-rotating also applies for the legs. 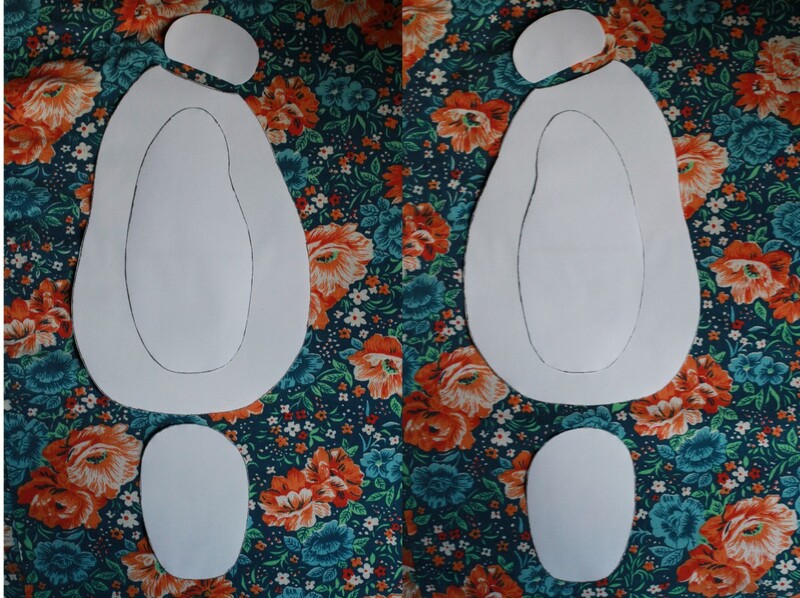 Once orthographic drawings of individual parts are well sized and proportional with one another, the next step would be to print and cut out these templates. Here's where the fun begins for you obsessive perfectionists out there like me. 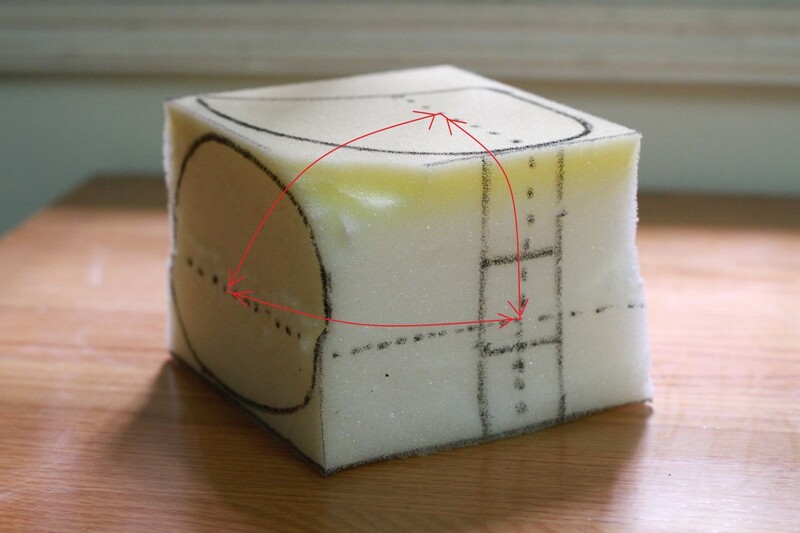 To translate 2-D shapes into 3-D figures, cushion foam blocks were carved based off orthographic drawings. 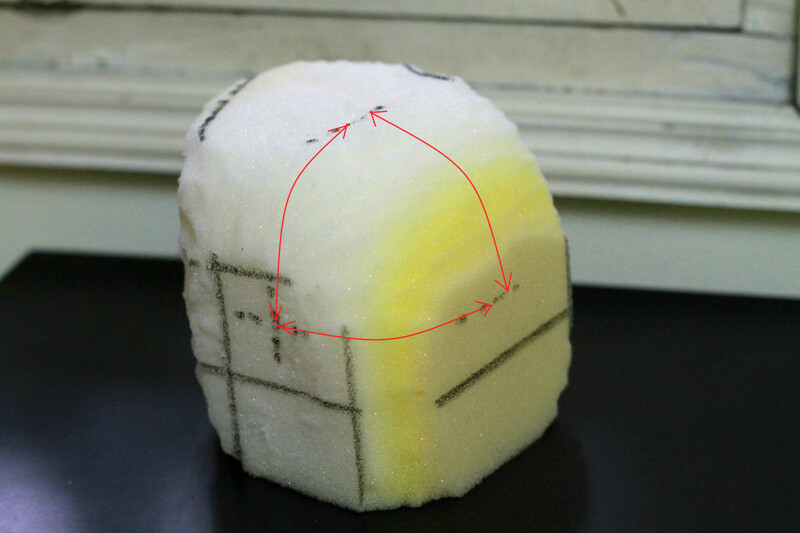 The original dimensions of the block of cushion foam must be greater than the final dimensions of the desired end result. 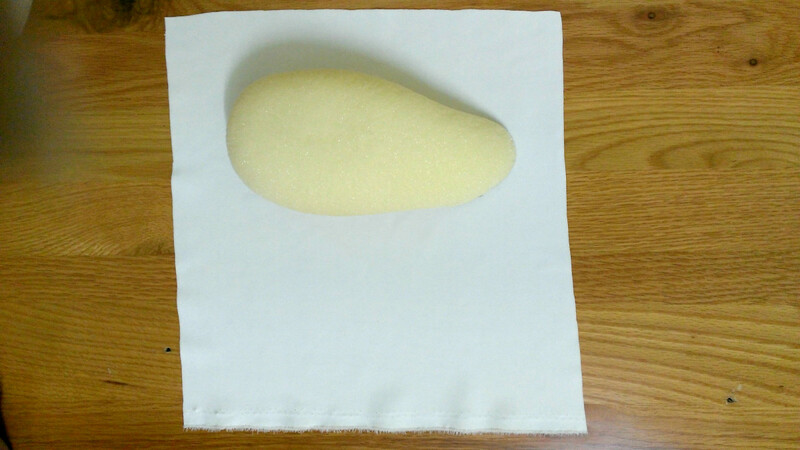 If a sufficiently large cushion foam piece is not available, you can use fabric glue to stick smaller pieces together. Had to stick 2 layers together to get a sufficiently thick block. 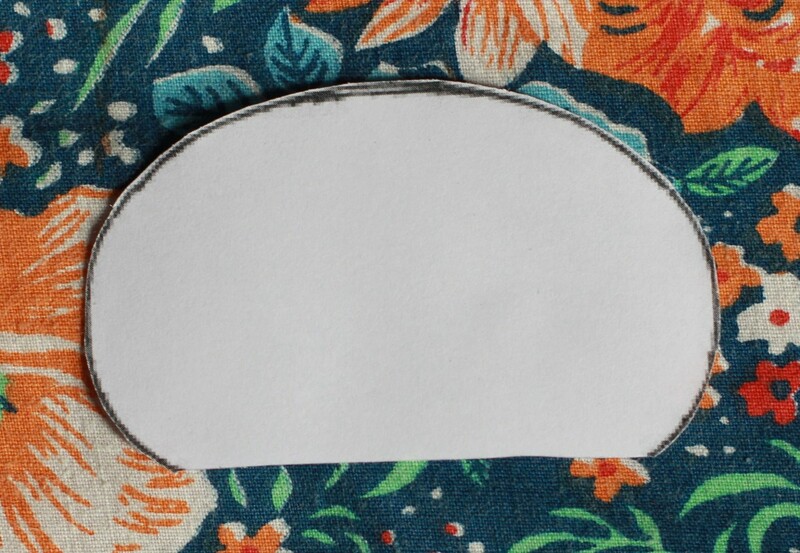 Use the front and side view paper pieces to make neat outlines onto appropriate surfaces of the cushion foam block. 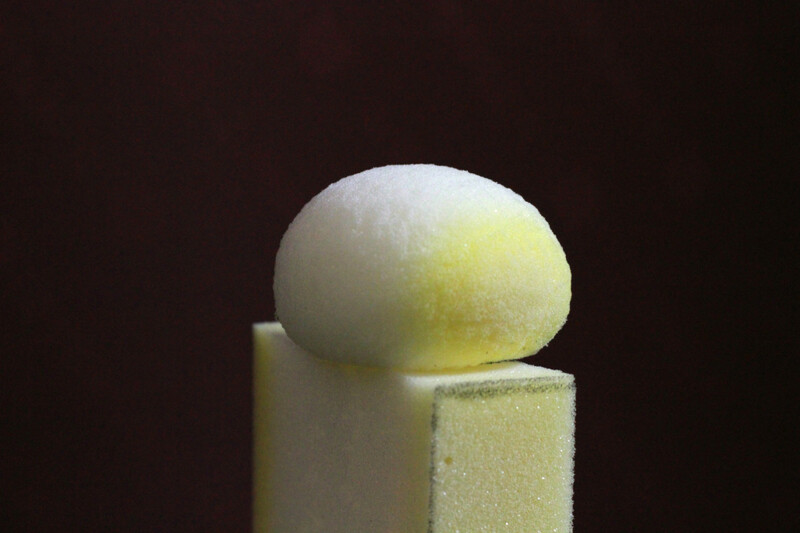 Ideally, the foam block you start with is just a bit larger than the desired end result. 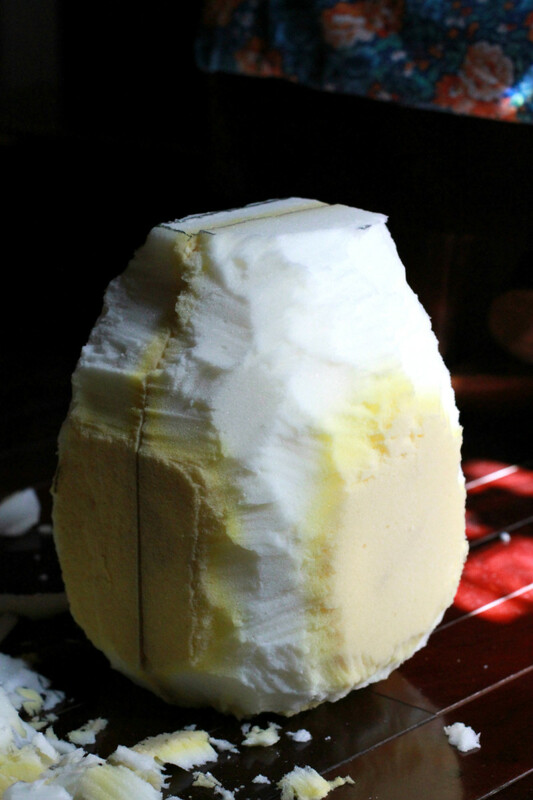 This reduces the unnecessary amount of time being spent on carving and the foam portion being unnecessarily carved out into tiny (often no longer useful) pieces. 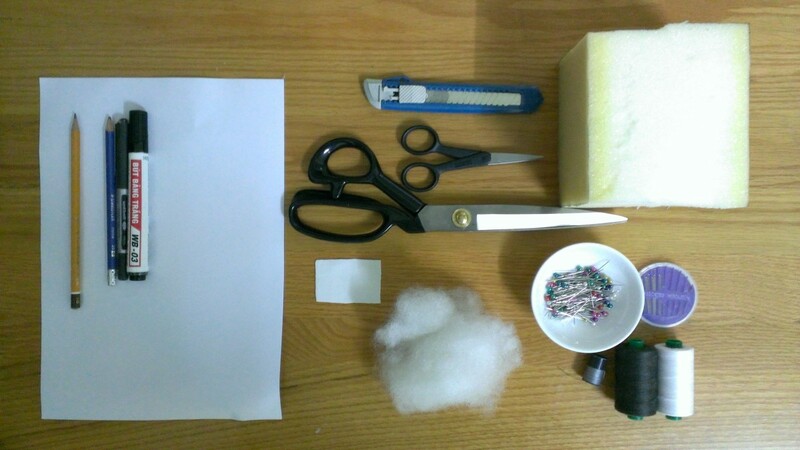 Prepare a good X-acto knife that's small enough to hold comfortably and to be able to use precisely. you don't wanna use a large knife and just slash pieces out randomly and erroneously and then have to waste time fixing the figure. 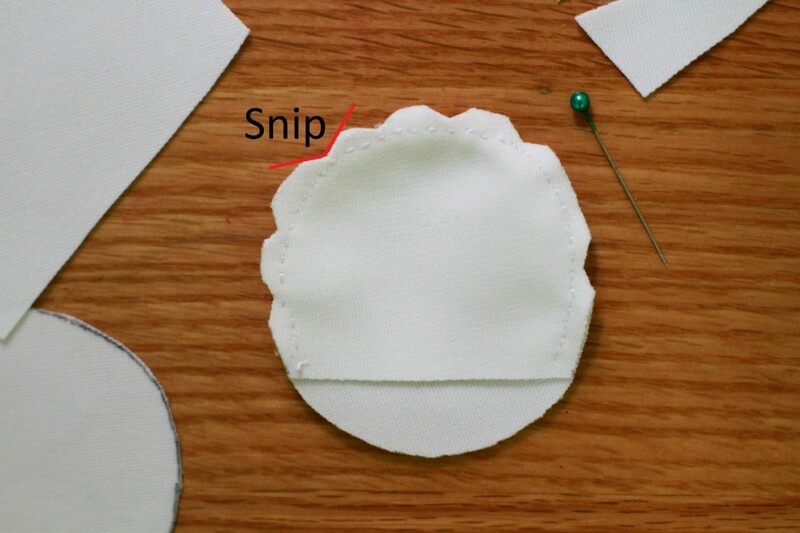 Also, prepare a really sharp, relatively small scissor for the refining stage, when small, even delicate snips are needed, not slashes and slices with a knife. 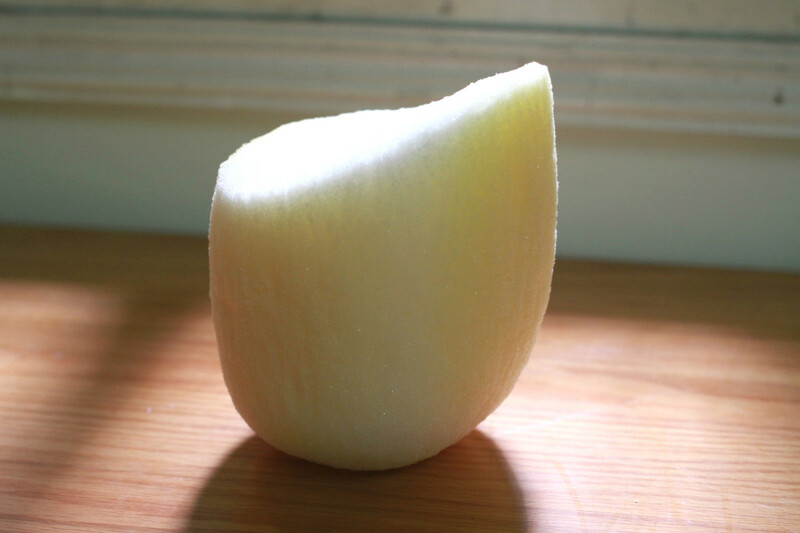 Have the paper shapes of the part you are working on in front of you as you carve. Frequent visual reference helps a lot at this stage. Start carving around edges first, the surrounding layer after to get a general feel of the object and to get used to it. Start slowly to allow time for the mind to visualize clearly the end result. A clearly defined mind is crucial in directing what your hands will ultimately actualize the foam block into. Perhaps this tip is applicable for every part of this project, but in my case, it became particularly apparent during carving foam blocks. 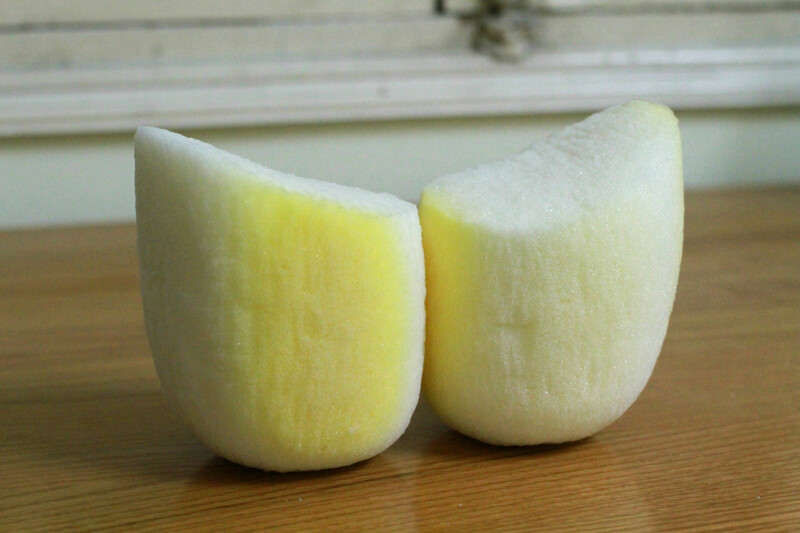 When carving, don't intentionally force yourself to focus too excessively. Instead, relax and be attentive or mindful of the object. 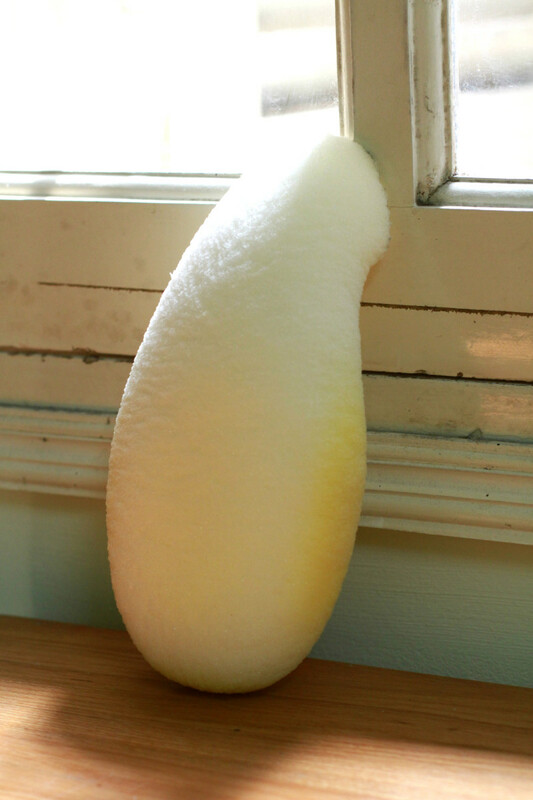 Look at it. Observe it calmly for a moment. 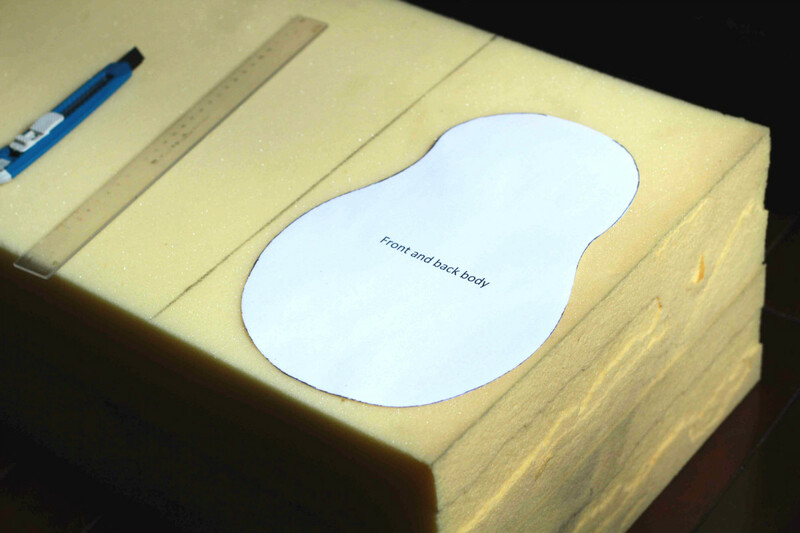 Let the hand holding the scissor (or X-acto knife, whichever your preferred carving tool) and the hand holding the foam figure to work in sync with one another by themselves. In time, you will eventually get into the zone and that's when the magic happens. There's no need to control or force anything. 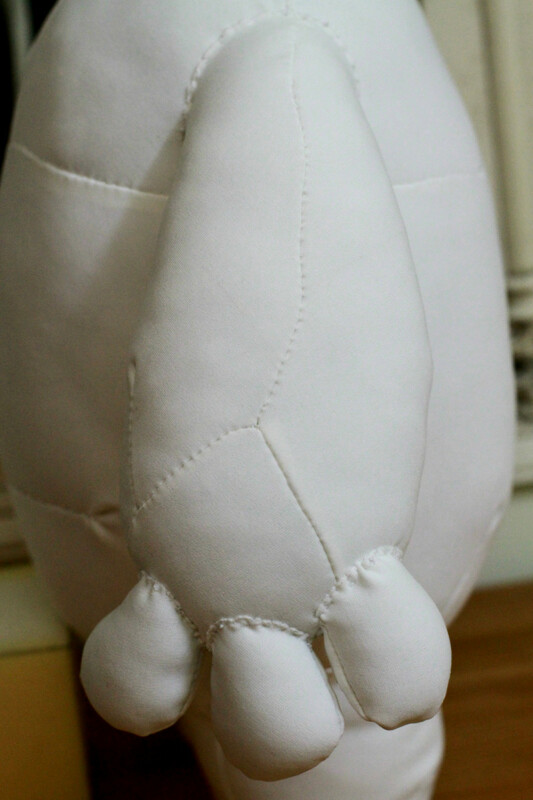 ...and then carve those glued pieces into shape. Did a rather badly job at that. 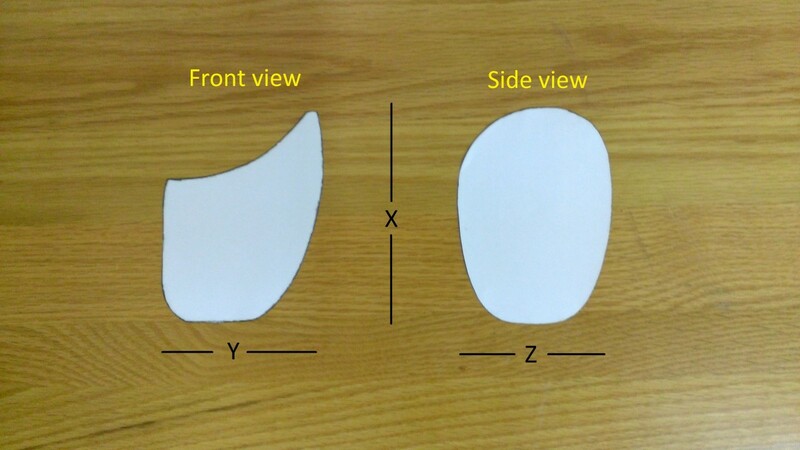 A well defined and polished foam template provides an accurate and precise foundation for next stages and ultimately for shaping the final result. 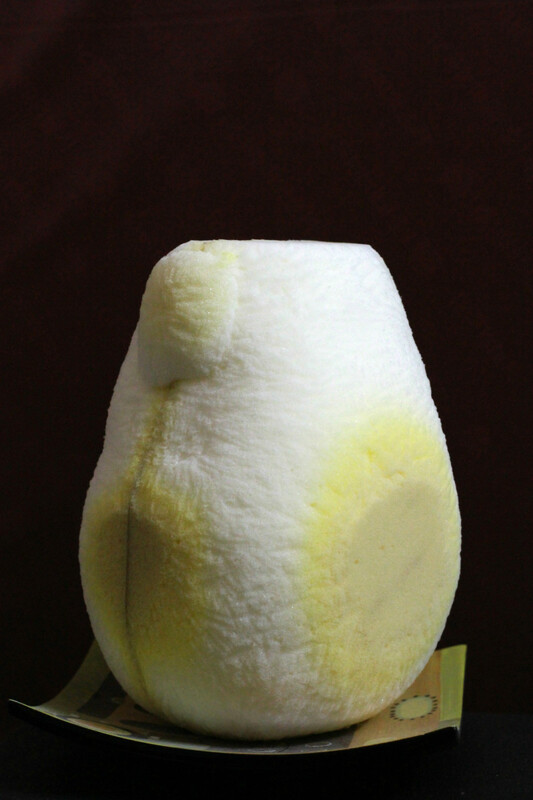 The head. Feel like taking a bite? Compare to other parts, the arms were particularly difficult to carve considering the shape is relatively more complex, or maybe it's just me. It's a good idea to assess since the beginning different levels of difficulty and complexity involved with carving different parts. The idea is to carve the least difficult part first and leave the most difficult one for last, when your skill would then be relatively more, if not a lot more, polished... or you could try to swim before learning to splash like I did with these arms. Since the beginning, I have used marker outline extensively to estimate the overall shape, but it never occurred to me until I started working on the legs that axis lines can function as a very versatile frame of reference. As I pushed onward with the left leg, I gradually became overwhelmed, mostly because of the big difference between the leg's outer vertical length and the inner vertical length. 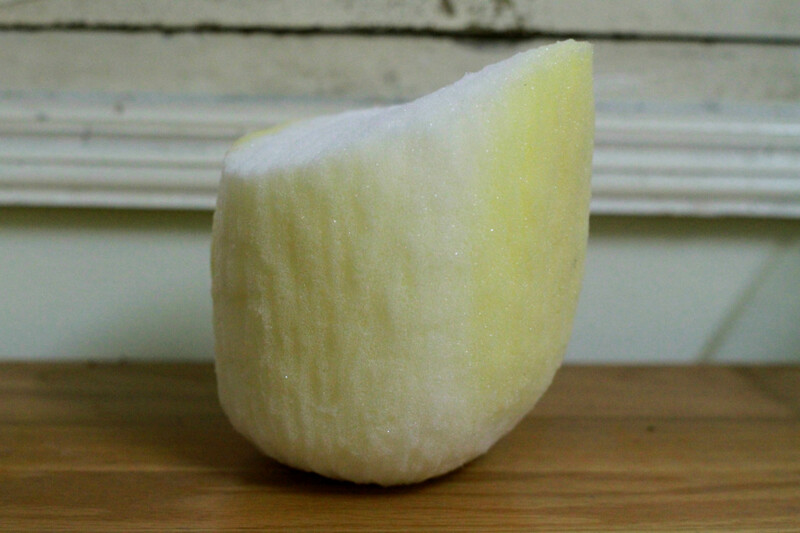 This difference somehow made it difficult to visualize on where to carve next. Basically, by marking axis lines (the red, disconnected lines in the figure above) onto the foam block, I could more easily visualize it in terms of the end result that I want it to become, a circular figure, rather than be distracted by the current rectangular state. The axis lines can be thought of as imaginary "edges" of the circle, if you will. Furthermore, in acting as "edges", the axis lines offer a relatively good estimation of the area that needs to be carved off (the blue area in the figure above). With the axis lines, I now have a clear idea on how far across and how far towards the center I should carve while still maintain a horizontally circular shape throughout. 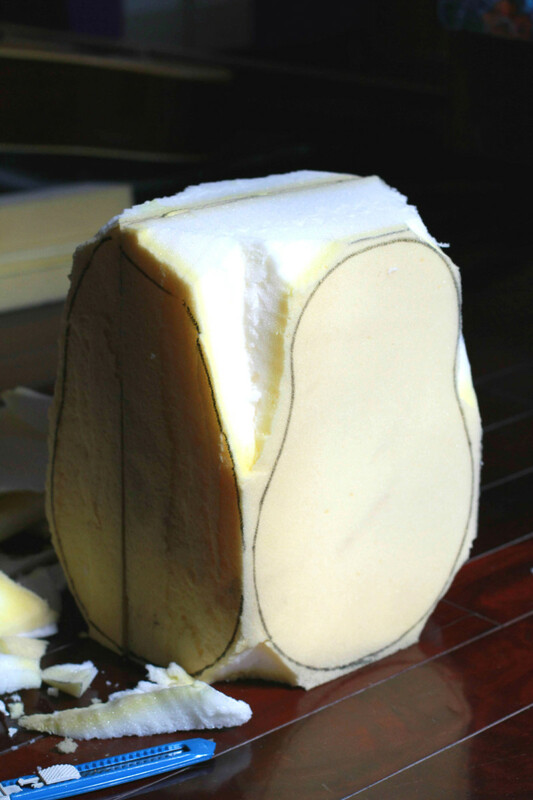 The same principle was also applied for the bottom of the leg, where the initial rectangular edge was soften into a round edge by carving off the excess area that lies outside the red lines. To have an even more specific estimation, you can mark with a dot, or even a cross. Axis, dot or cross, same idea, use markers systematically to visualize more effectively. Try them all, invent new ones and see which works best for you. Better yet, share your ideas in the comment box! Apparently, the overall proportion is a bit off, if not to say wayyyy off. 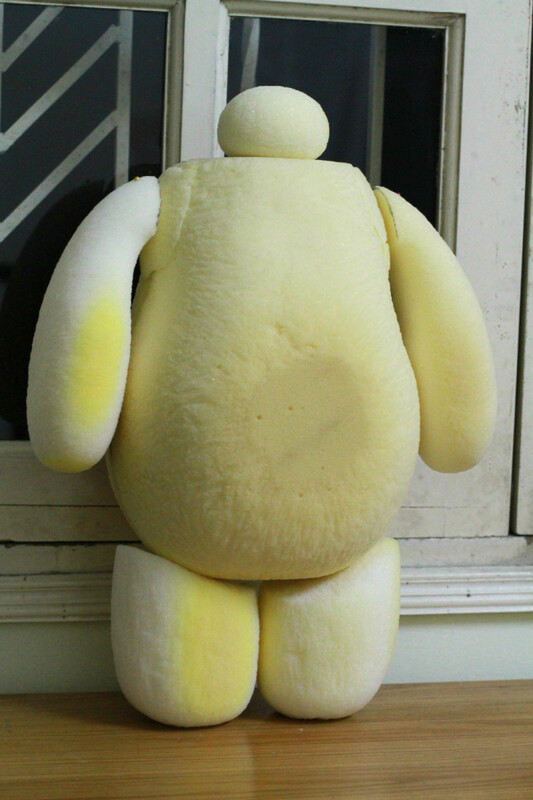 the body is too large, the legs are too wide and long, and the head is too small. 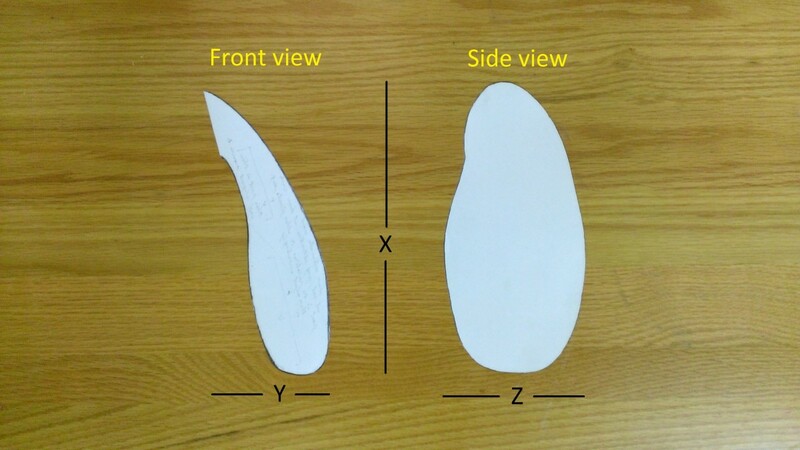 Should there be the need for fixing the foam template, be flexible with how you do it. 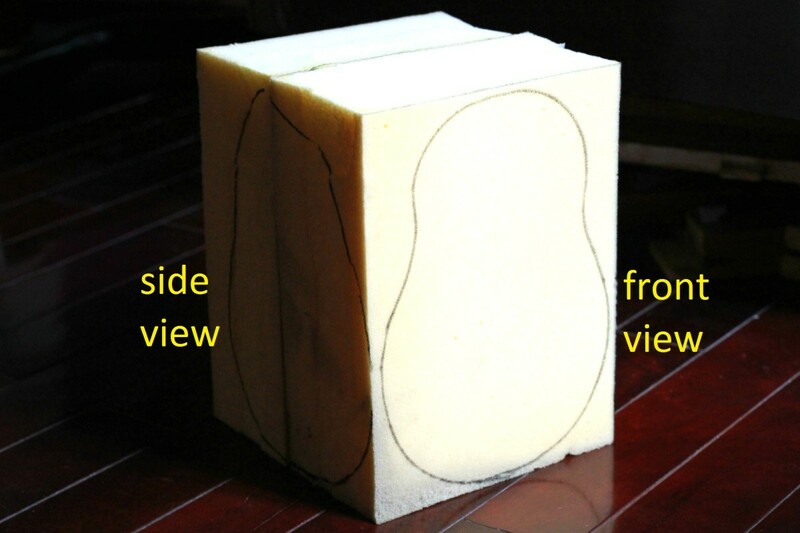 In this case for enlargement, instead of making an entirely new head, you can use tape and scrap foam pieces. Hmm... something seems out of place... or not in place? Yep, the fingers are missing. Since the start, I figured considering they are relatively small and have a simple shape, resembling the head's, I would just gonna yolo. First attempt. Second attempt. Done. 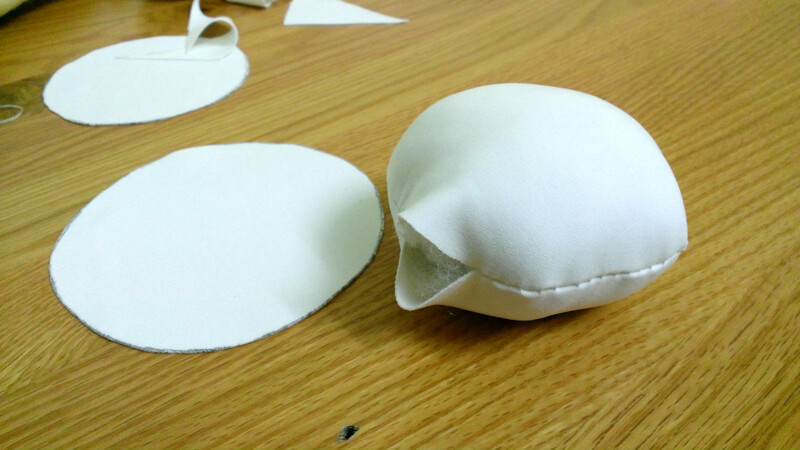 Once the foam template is satisfactorily sized and proportioned, the next step would be to make the fabric shell to hold the stuffing. While it's fair to say that each stage contains its own difficulties as well as glories, I personally had the hardest time learning how to work out this stage properly compare to other parts of this project. 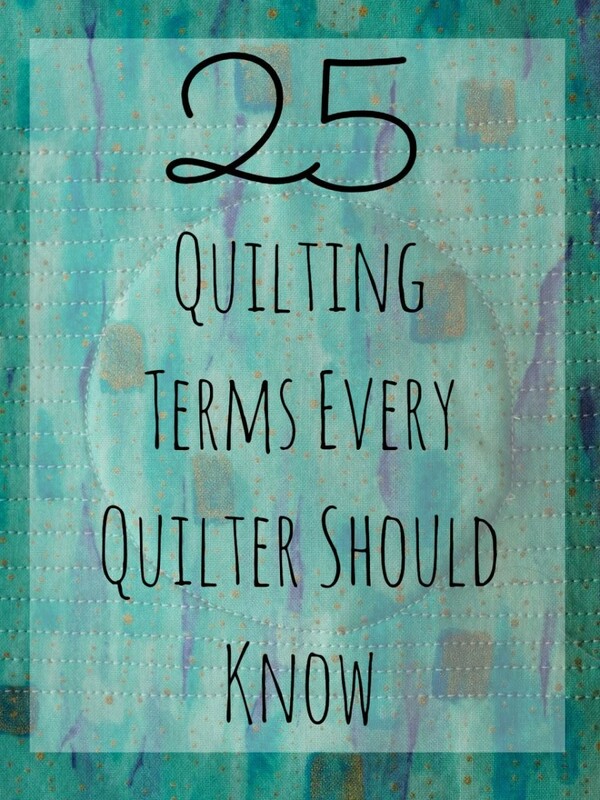 However, once I had gotten the craft down and could feel and somewhat know what I was doing, the skill surprisingly became the most straightforward and natural to re-apply to different situations. 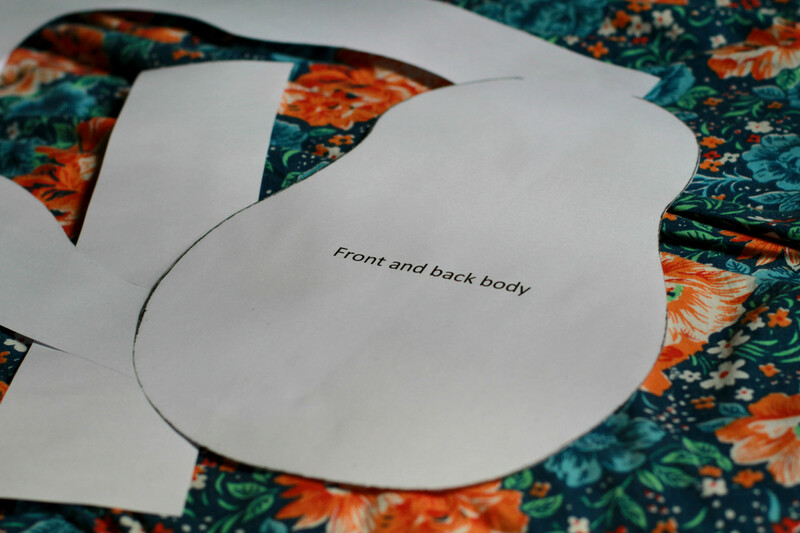 First, cut out a piece of the fabric of choice.This piece should be sufficiently long to be able to wrap around the foam figure at least 1-2 times and sufficiently wide to be able to close off any potential opening in the wrapping. 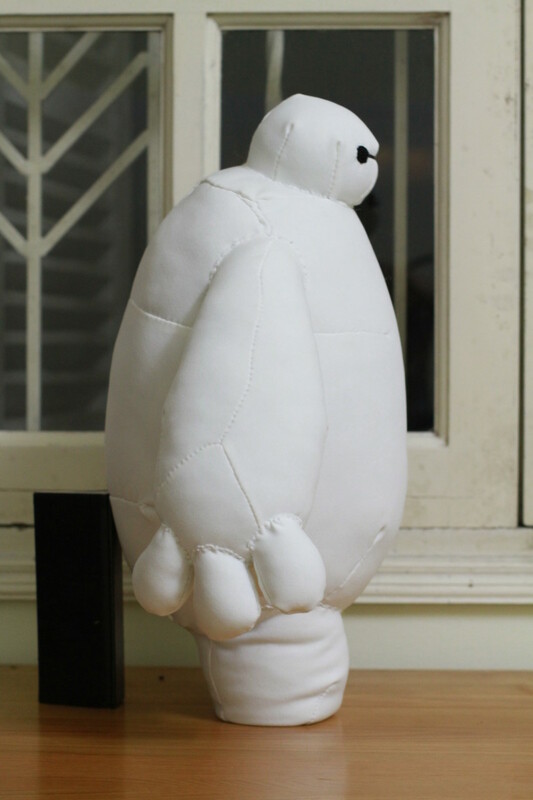 It's probably best to use a somewhat stretchy fabric material so that once stuffed, the figure would be bouncy, cuddly and not too static. note! : the directly below draping demo was the first and very poorly executed attempt. 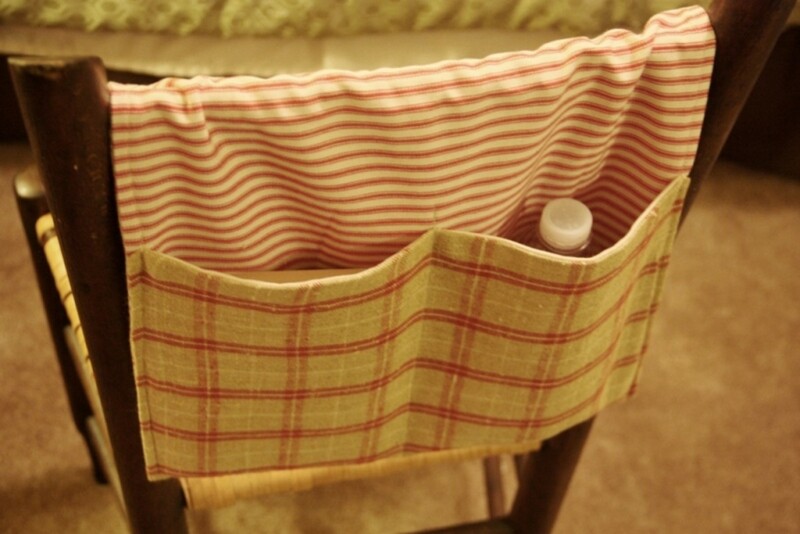 To see a much better one, scroll down to Effective draping: section. 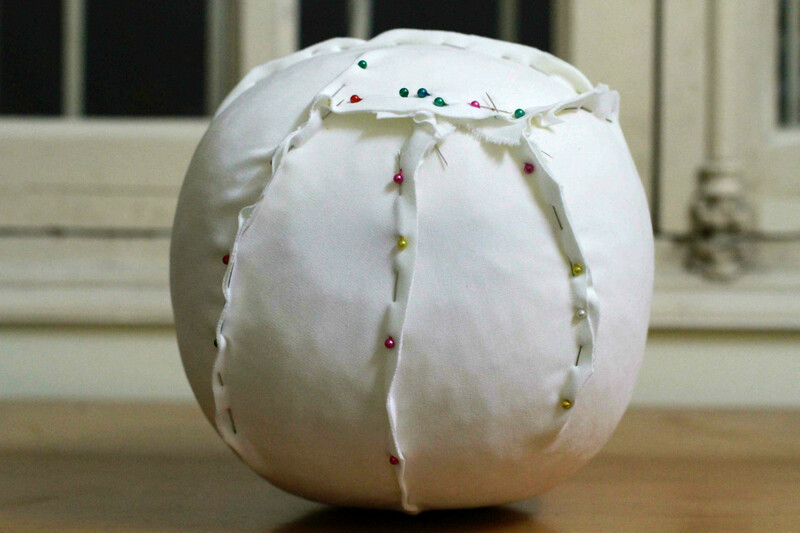 Sew securely along pinned edges. Remove pins as you go. Prepare a whole box of needles. I must have bent, snapped or lost around 6 of them. 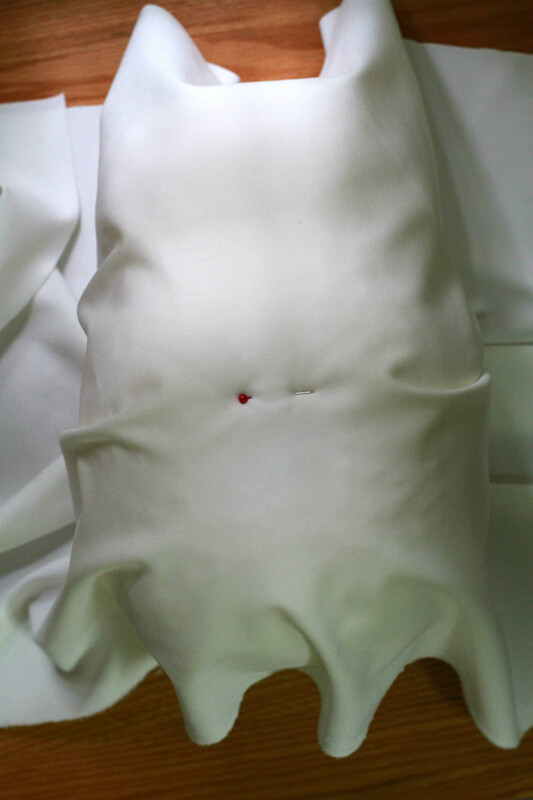 If you are anything like I was, you would be looking at the draped figure and wonder - how in the world do I sew? The very thought seems so out of this world, no? 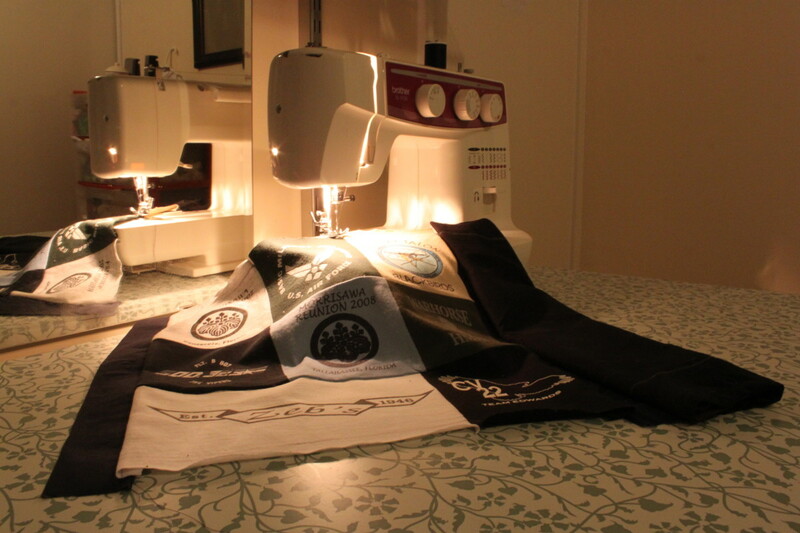 It never occurred to me to use a sewing machine, partly because I didn't have one available right by, partly because I thought it would be more fun to do it by hand. 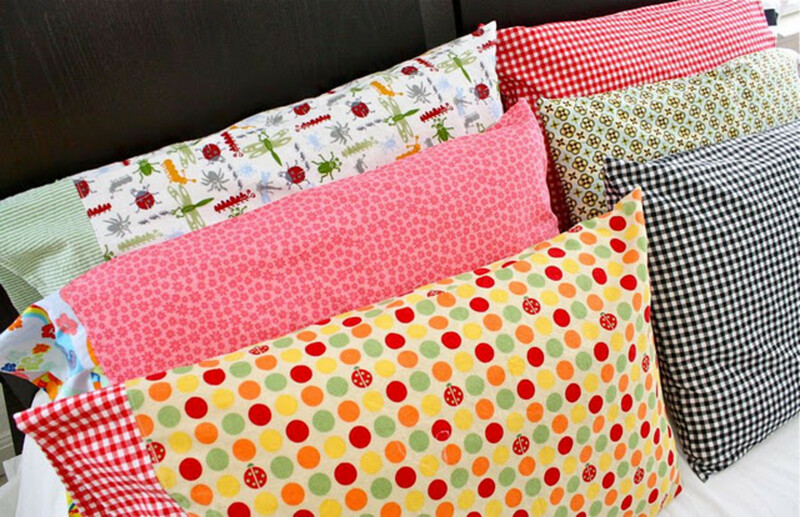 So anyway, sewing by hand, how does that work? 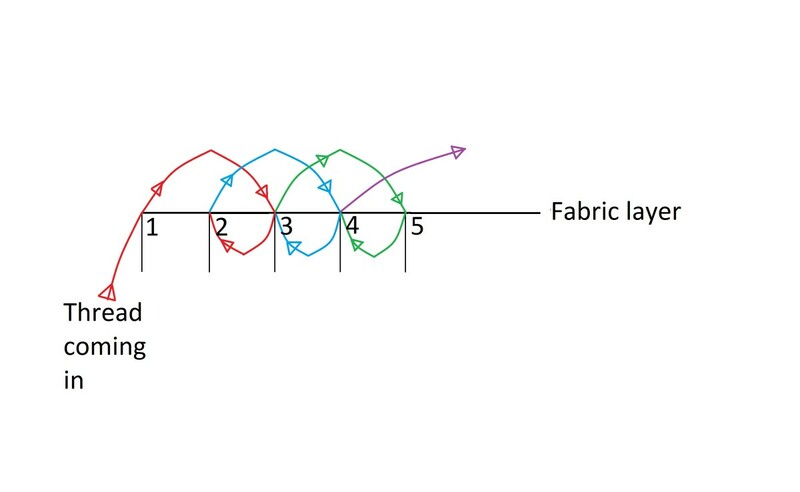 I had to consult someone (thanks mum) and was suggested a technique based on the mechanism of how sewing machines function, but can be operated by hands as well. It may help to get a scrap piece of fabric, draw a straight line on it and mark out equal spacing for some initial practice before the real thing. 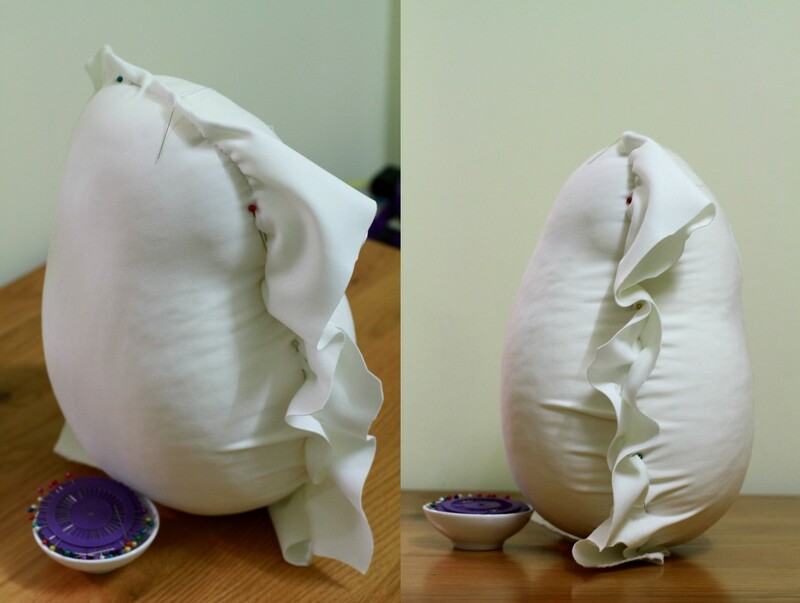 ...which is turning the fabric shell inside out and go nuts with the stuffing! 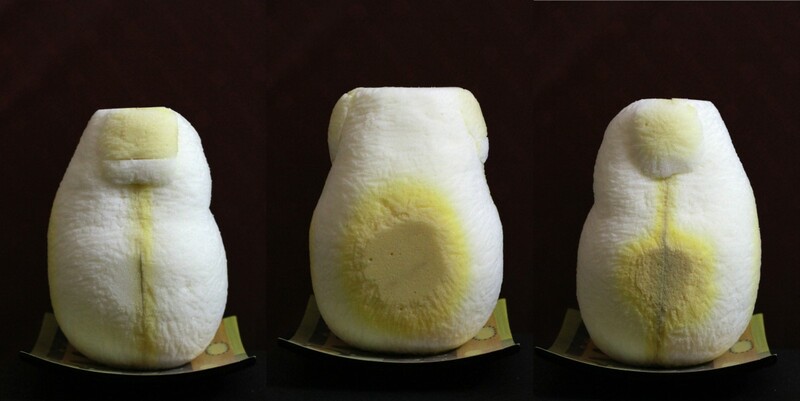 Initially, I tried with 100% cotton fiber (right picture above), but it has the tendency that the more it's squeezed, the more densely packed (and thus hard) it becomes, and this is just insanely counterproductive if our aim is a bouncy, chubby and cuddly stuffed toy that loves and can tolerate tons of hugging. 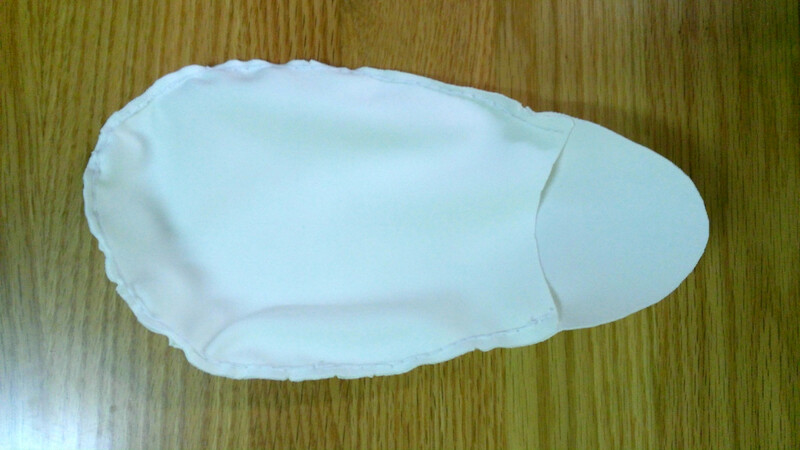 There are many potential stuffing materials but I eventually went for polyester filling. 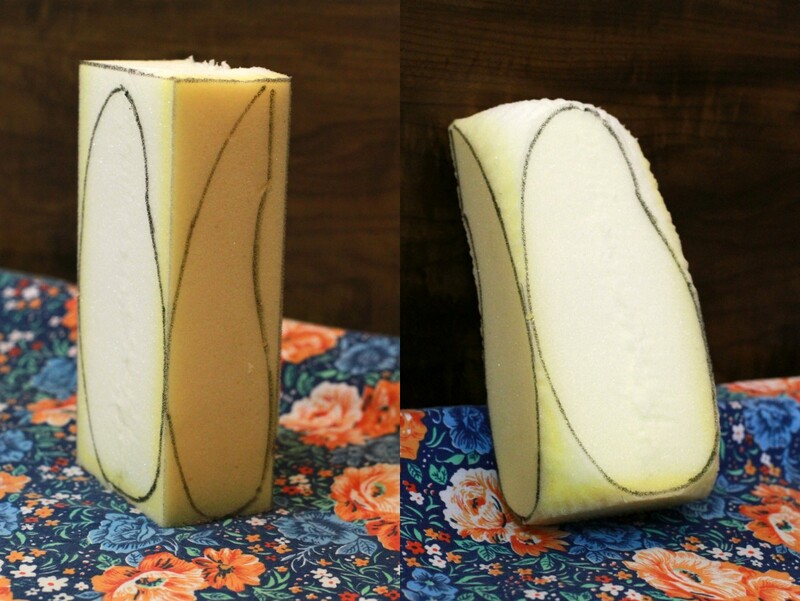 This has a soft feel and bounces right back as you press on it. Perfect! 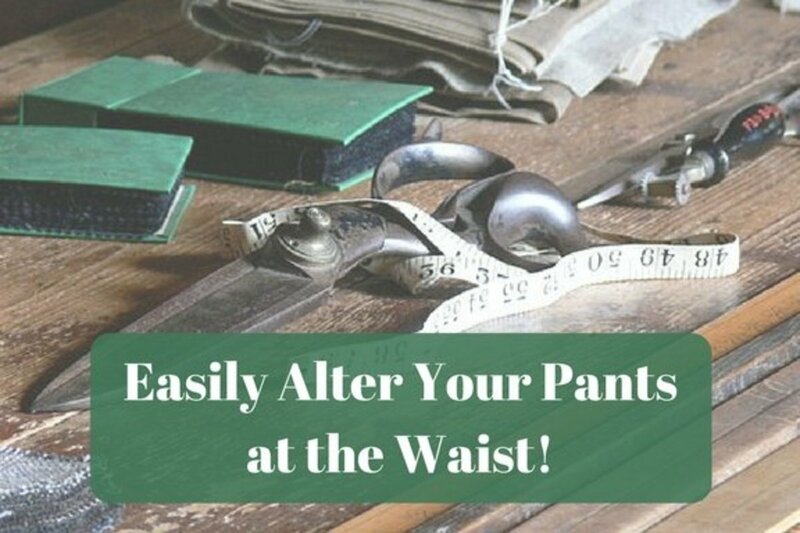 As you sew parts together, to prevent them from being placed at the wrong spot, facing the wrong direction, having the wrong orientation or any other ridiculous unwanted errors, use pins to locate and hold parts securely to one another. I know what you gonna say. Yes, that belly button was definitely intentional. And so was that second belly button... and its chest scar buddy. Right arm. Check out those veins. Left arm. More elegantly shaped and less vein-y, no? Seeing how the first attempt can be vastly improved, I decided to give another shot. 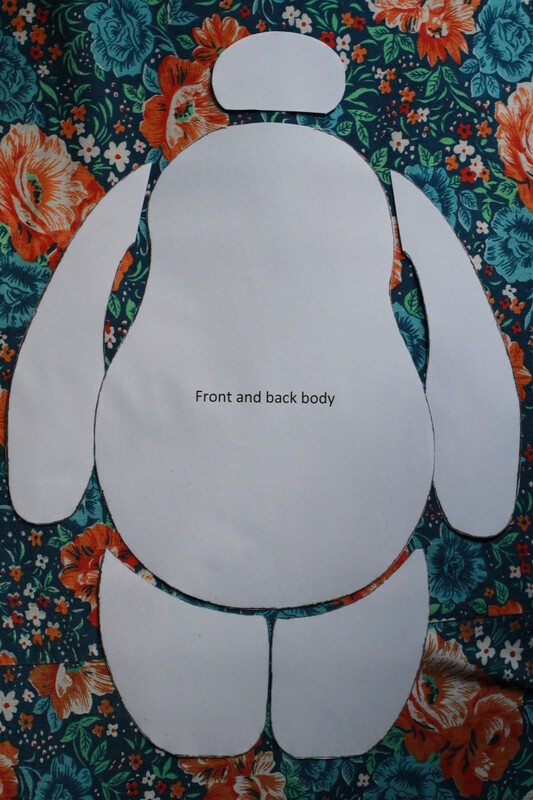 Previously, the body foam template had a flat top surface and unsymmetrical shoulders. 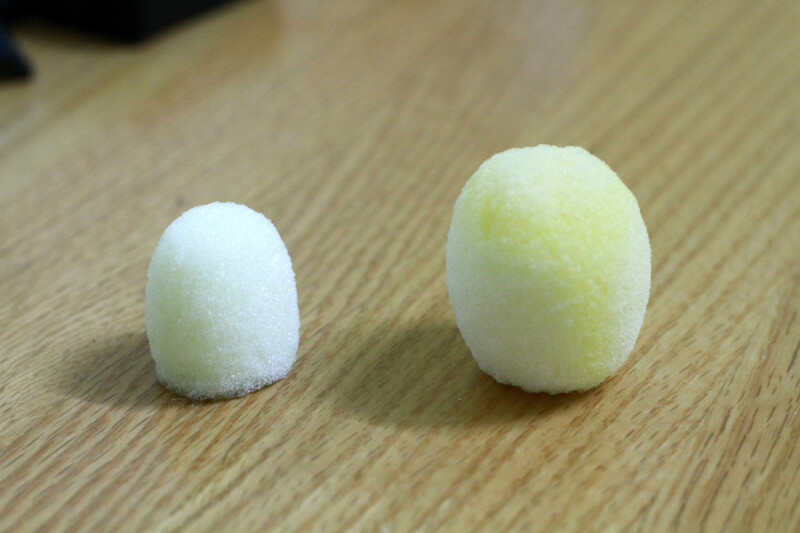 These shortcomings eventually resulted in a deformed translation during the fabric shell stage. So gave the shoulders some shaping and a round cap. Notice how pins can hold foam pieces together just as nicely as glue or tape, but probably a lot more versatile because pins can be removed to relocate pieces. Before, I wasn't providing a lot of helpful materials on how to drape properly, mostly because I struggled rather greatly in learning this stage, and this caused me to frequently focus too excessively in practicing and neglected taking pictures and notes completely. But now that I've somewhat got the hang of it, here's the demonstration for draping an arm. 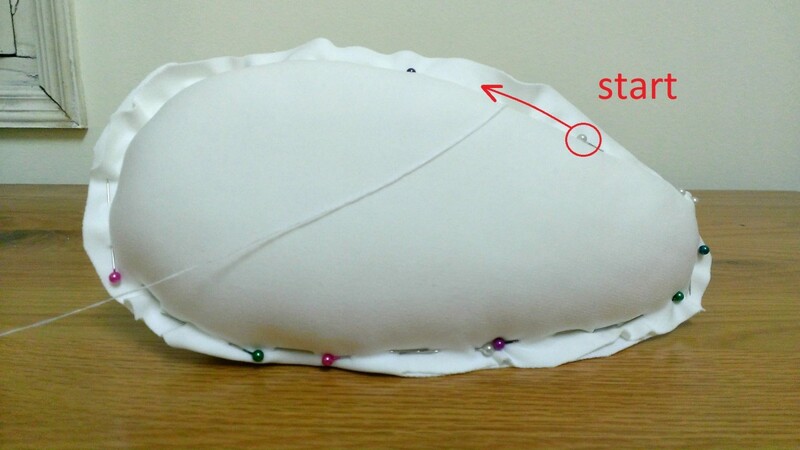 Lay the foam piece on top of the fabric piece like so. 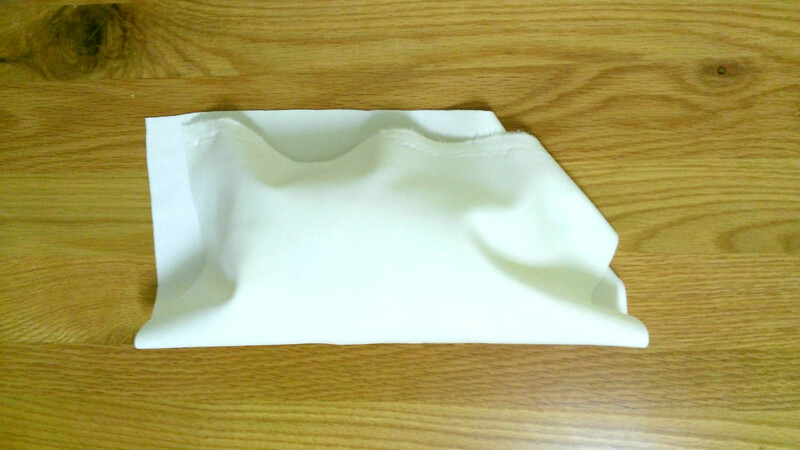 Fold the longer edge of the fabric piece over the foam piece. 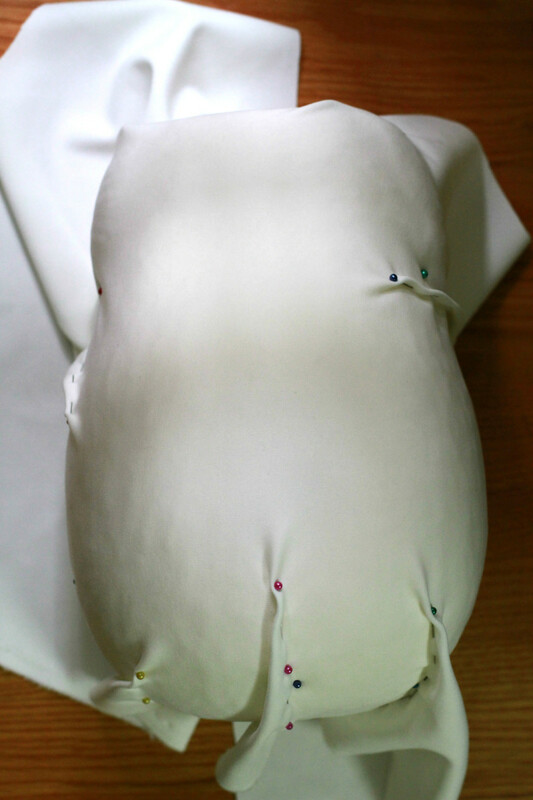 Locate and anchor the fabric securely to the foam with pins. 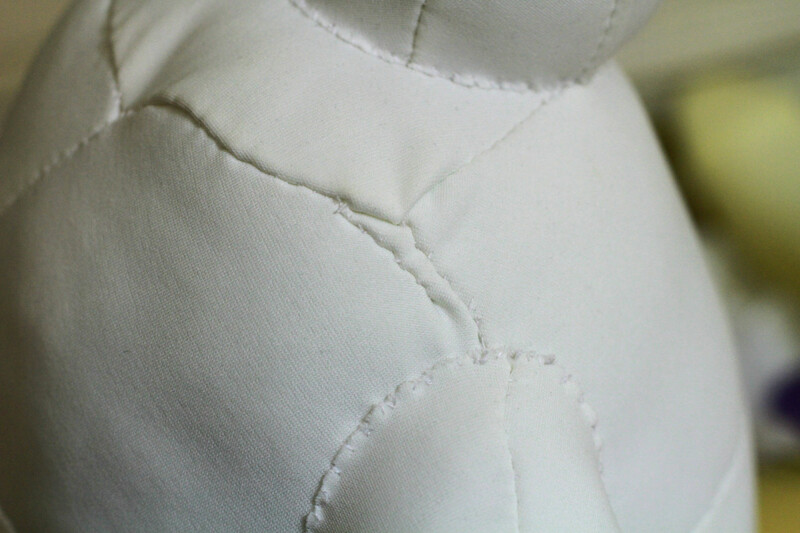 Anchoring pins can be used to mark where the seam is going to be. In this case, along the surrounding edge. 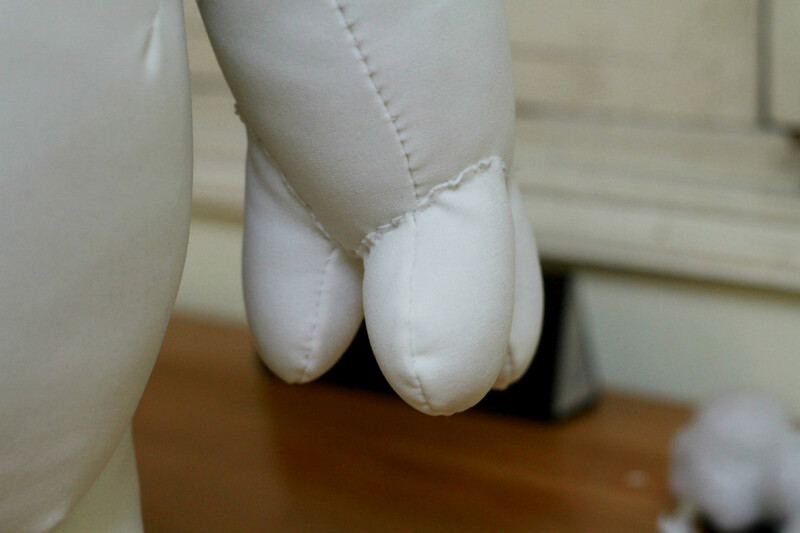 Once the fabric is held relatively tightly to the foam (you want the fabric to not move around at all to avoid misshaping the final figure! 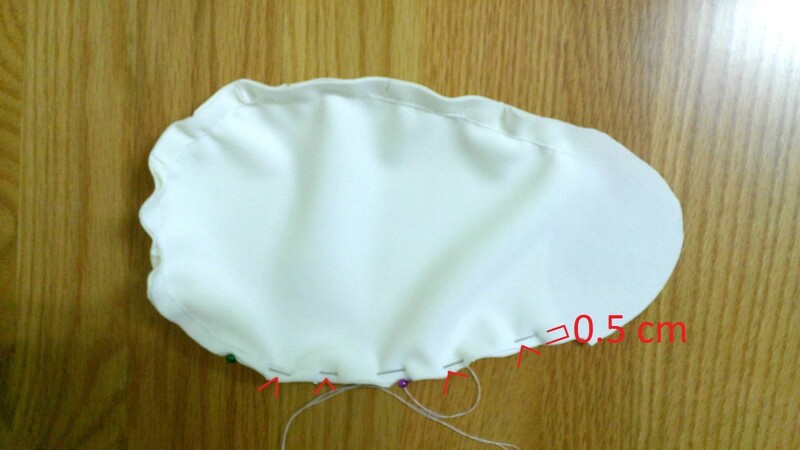 ), pin around the edge, where excess fabric would lie outside the pinned zone. 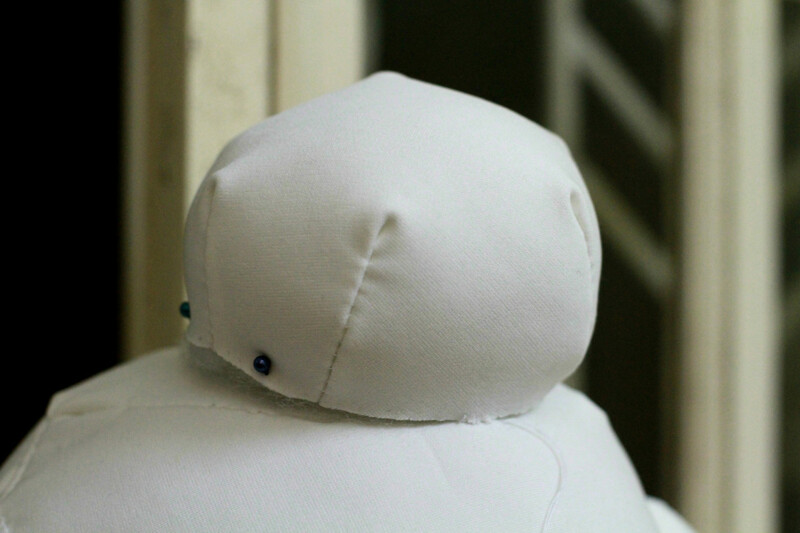 The edge should be pinned relatively tightly to produce an accurate final form. 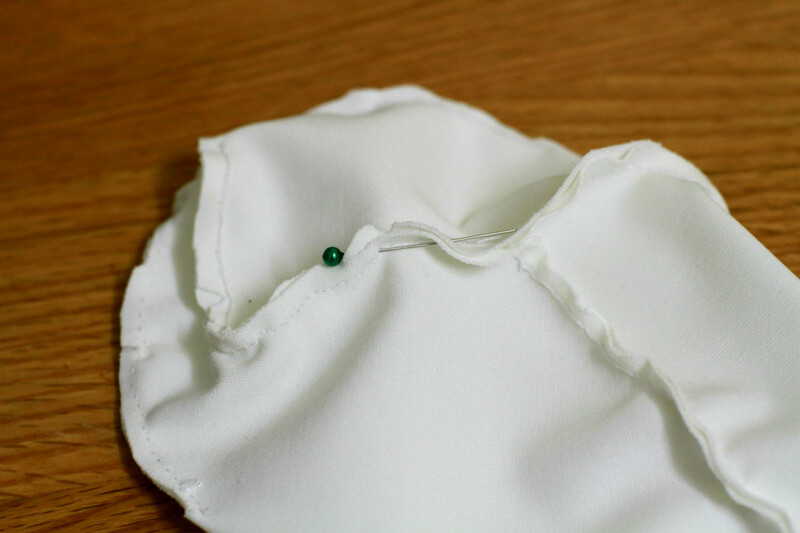 Once that's done, sew along the pinned edge from one end. Ok, here's the tricky part. 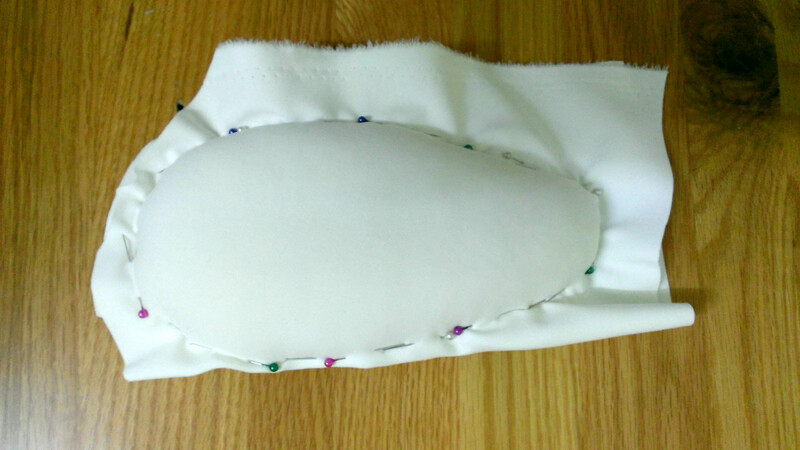 Inside the fabric shell is the foam piece, and you don't want it to be in there once the sewing's done. So what I did was sewing up to a point, and then unpinning the remaining portion to take the foam piece out and then continuing to sew along till the end. 1. 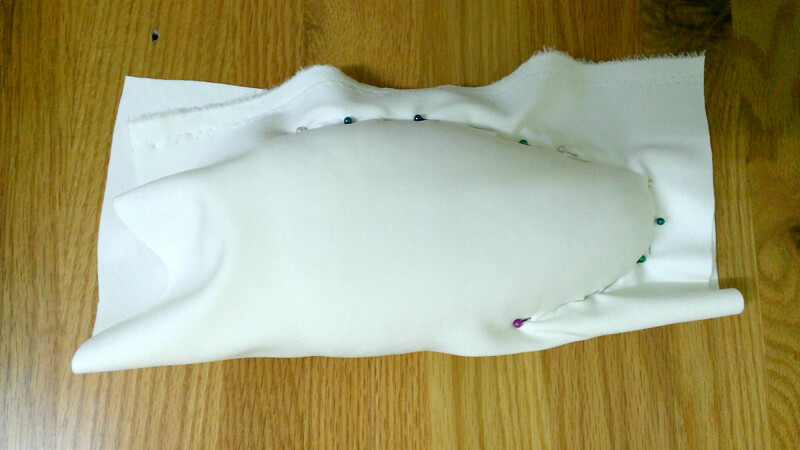 Cut off the excess fabric down to the same length (in this case about 0.5 cm) away from the pinned edge. This helps a lot with estimating. 2. Mark with snips. 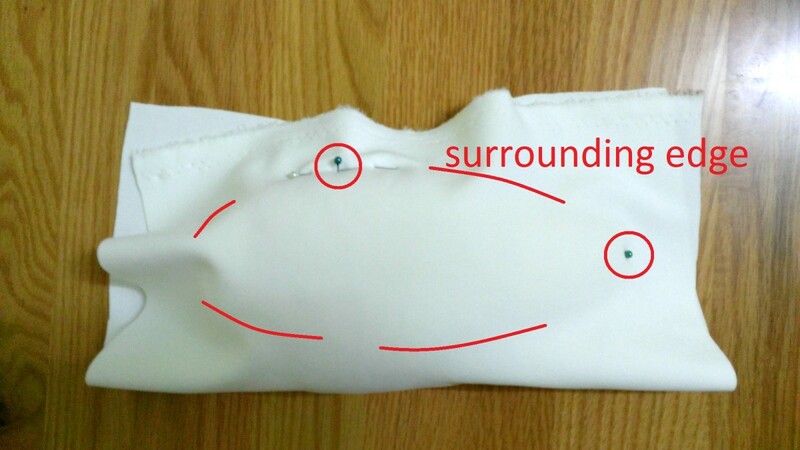 Once the pins are removed, line the edges again by matching snipped locations. A more properly shaped head this time. 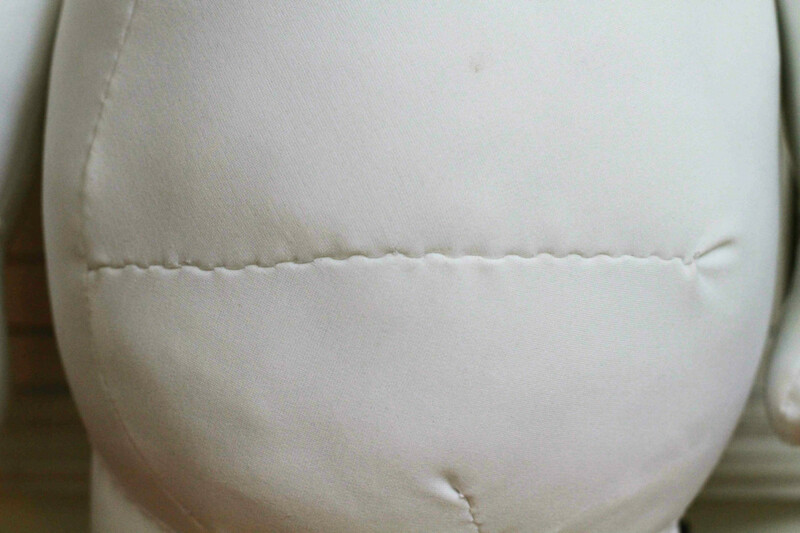 It's rather hard to close large openings with the ladder stitch once the stuffing is inside, so try to avoid having those. Used buttons for eyes this time. It would highly likely take more than a single attempt to get it absolutely right in every way. Nevertheless, it doesn't take more than conviction, dedication, mindfulness and passion for learning to get a decent start, or to start again! 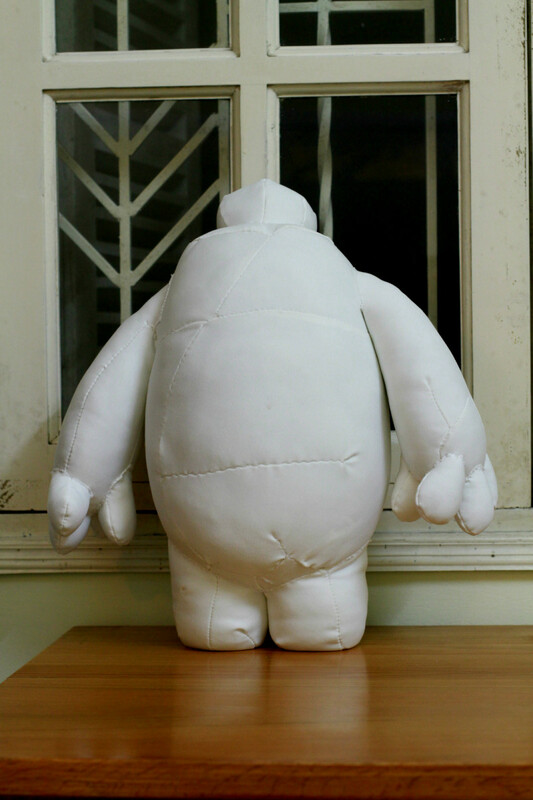 Looking back now, the time I spent making this Baymax might as well have been wasted. 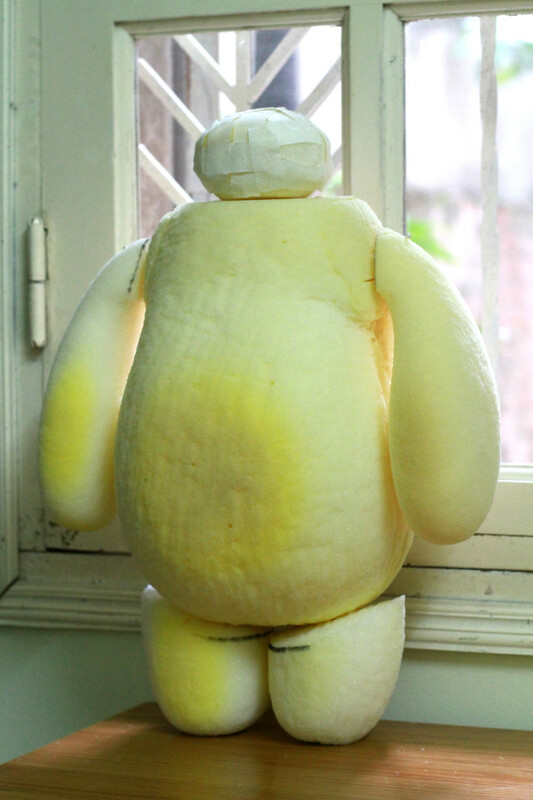 Honestly, heaven knows what beneficial or significant consequence can turn out in the long run from something so (at least as it seems) trivial as making a stuffed toy. But however it's going to turn out, I enjoyed immensely every bit of this journey and am so very glad in ending up with a story to share. Best wishes for you in finding something worth giving everything you've got, every last drop of your concentration, dedication and effort, something that you intuitively know and feel worth spending time for, against all odds and discouraging thoughts from perhaps others or even yourself that such pursuit is rather silly and futile. Sometimes, the urge to concentrate wholeheartedly into doing simply for the sake of finishing as quickly or as soon as possible may arise. When that happens, don't give in. Take a pause. Observe what's at hand. Return to action. Take it slow. Be mindful of the moment. A great peaceful enjoyment will surely arise. By chance that you feel like taking up a similar project, there's definitely a lot of helpful information from other sources as well that can take you much, much further than what I have attempted here. Hope you enjoyed the ride. Share your questions, thoughts, tips, inspirations and projects in the comment box! 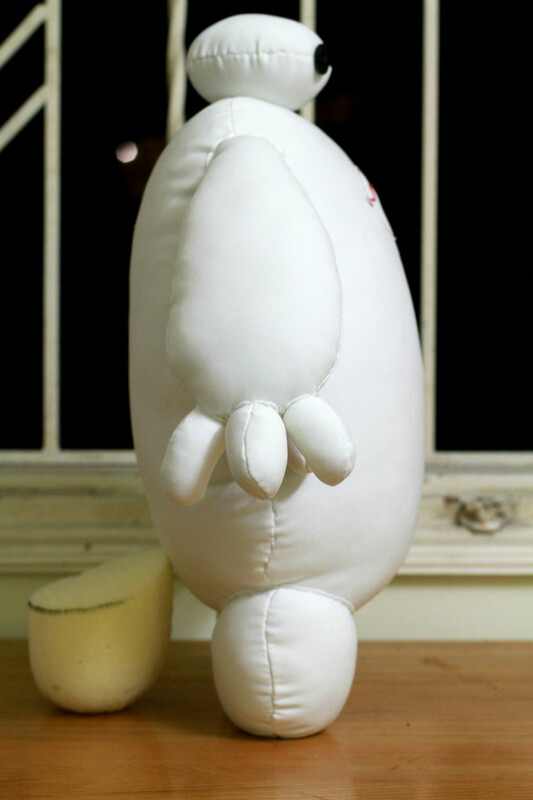 If you were to make a stuffed toy, which character would it be based on? 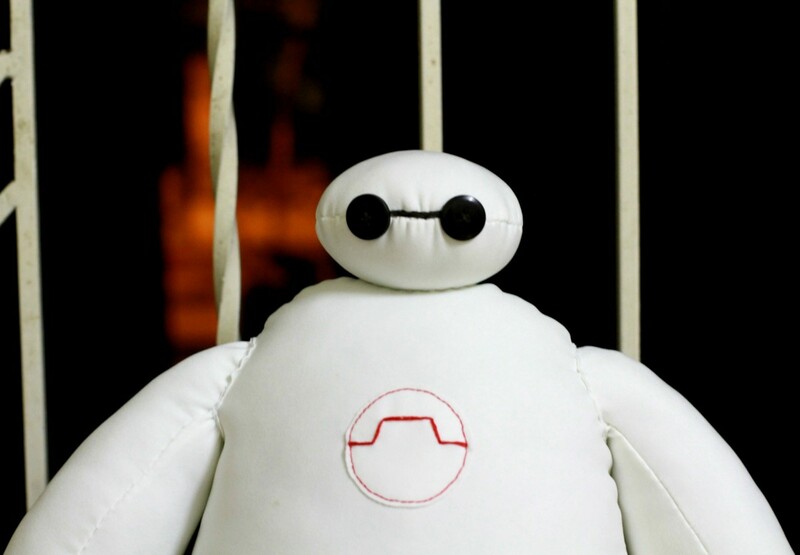 This is such a cute looking toy and you make creating the toy look like so much fun. I'll have to try it sometime. Thank you one and all, glad everyone enjoyed it! That's fantastic. What an interesting technique! That's insanely cute, but I think I'll have to stick to amigurumi. Great job though! My boys love this movie! My, what a project! You obviously have a whole lot of patience - and a good camera. :) Congratulations on the very interesting Hub of the Day! I don't think I have the patience to do this, and now you have V2 on the way!! Wow. 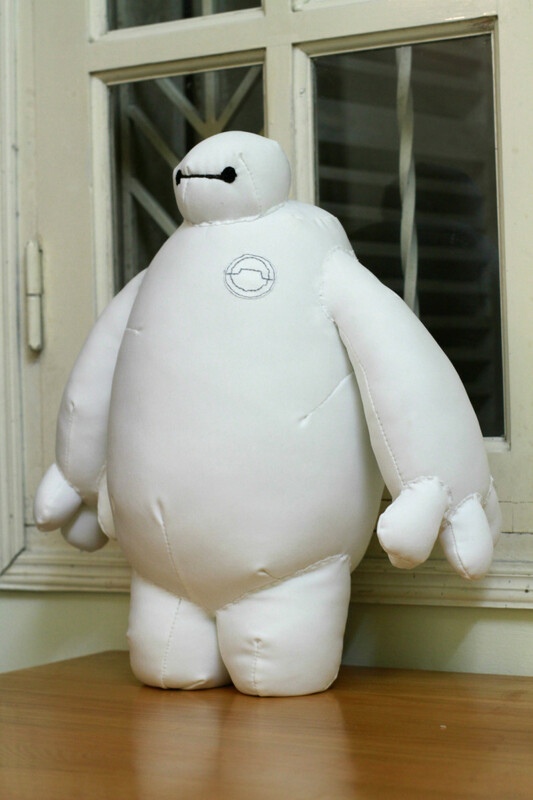 Congrats on HOTD and looking forward to the new and improved Baymax. 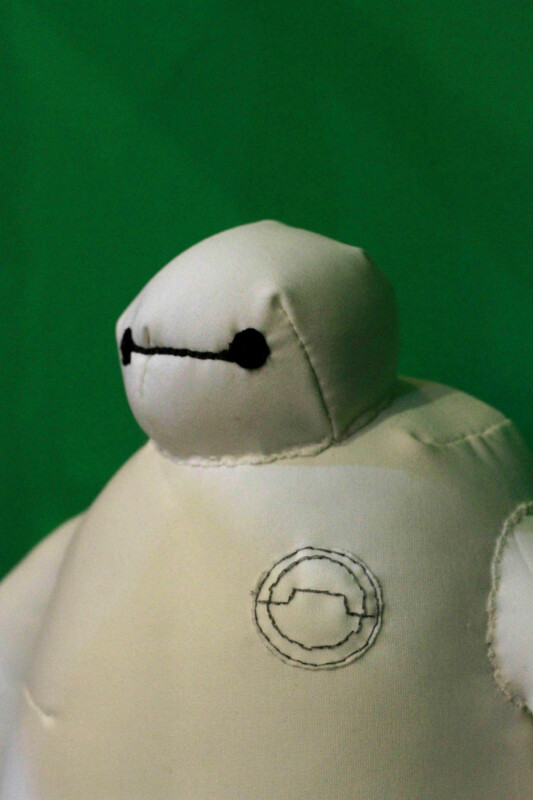 It certainly looks like Baymax and I think it would make a good museum piece in a soft sculptures exhibit. I don't know many people who attempt such challenging projects! It makes me smile. What an interesting approach! 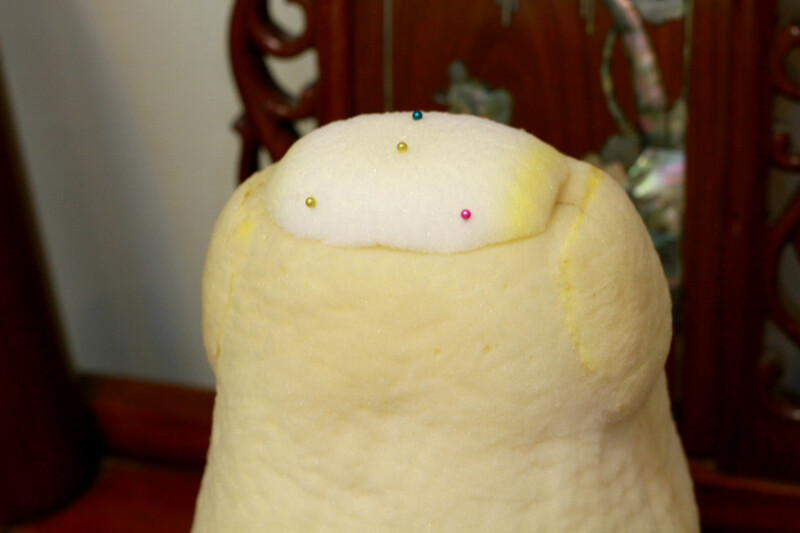 Usually people sew the fabric part into a shell and then stuff the fabric with loose fluff. 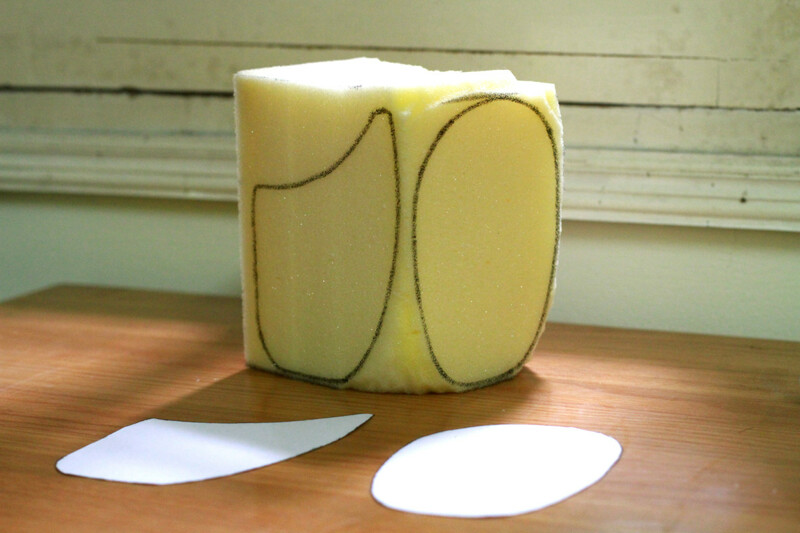 I've never seen it done by carving a block of foam before. 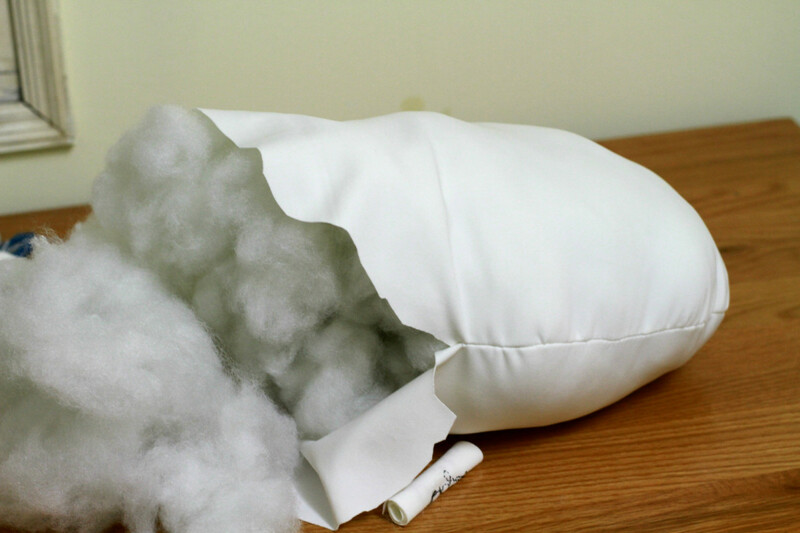 I tried to make a stuffed animal once myself, but gave up! It is harder than it seems like it should be.